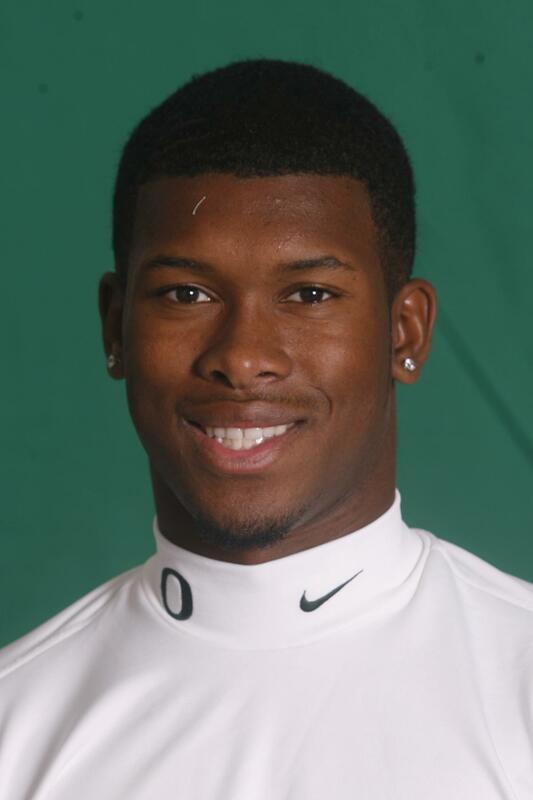 In memory of an outstanding individual, teammate, classmate, football player, brother, son and grandson, the Ducks will honor Todd Lamar Doxey throughout the 2008 season by every player wearing a helmet sticker with his initials, as well as having a different Oregon player wear his No. 29 jersey each game. 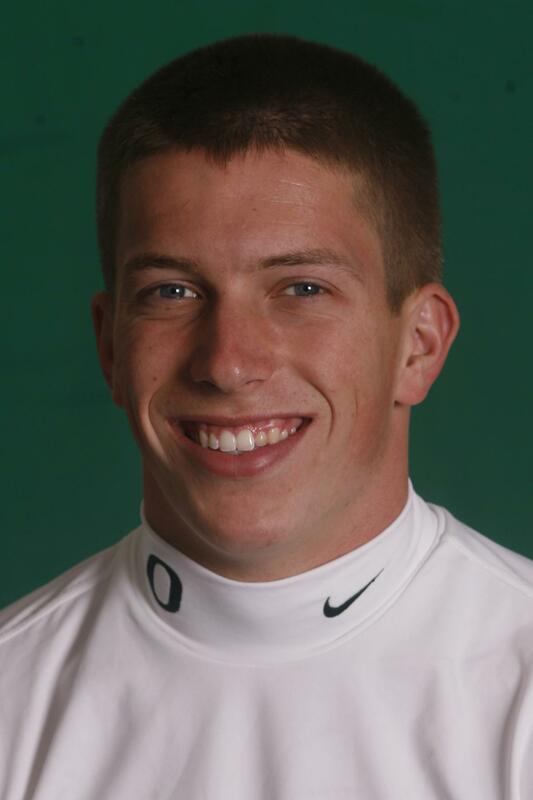 Todd was a victim of a swimming accident on the McKenzie River in Eugene-Springfield on July 13. Team�s top horizontal jump addition in 2007-08. 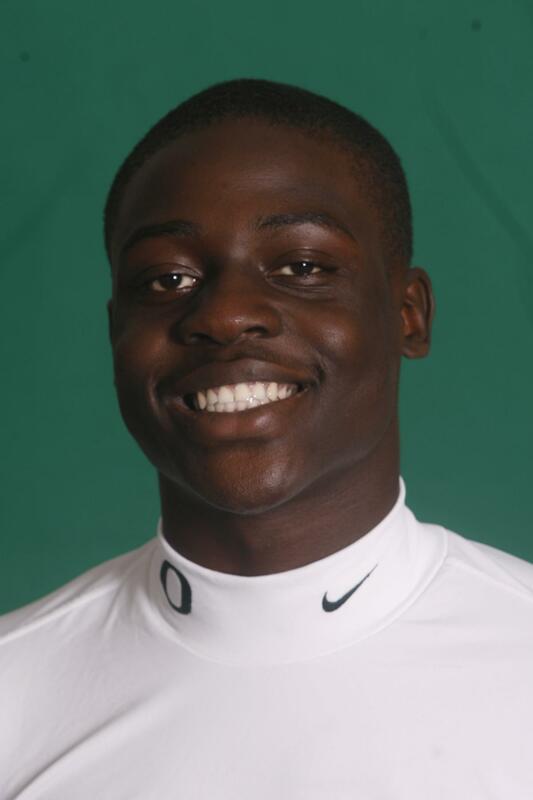 Oregon state prep long jump and triple jump champion as senior. � Has benefited from being in the system the past two years and is beginning the reap the fruits of his labor after coming off an encouraging spring. Improved tremendously in his knowledge of the offense, which has been his primary hurdle limiting his opportunities in the past. His better grasp of his assignments has led to him playing faster, enabling him to utilize his natural talents without always analyzing the situation first. His renewed confidence and comfort levels allowed him to play more like the veteran that he is. Still forced to be creative with his blocking schemes in order to overcome his size, but utilized his knowledge and experience to find ways to accomplish his tasks. Carried the ball five times for 56 yards in the final spring scrimmage. 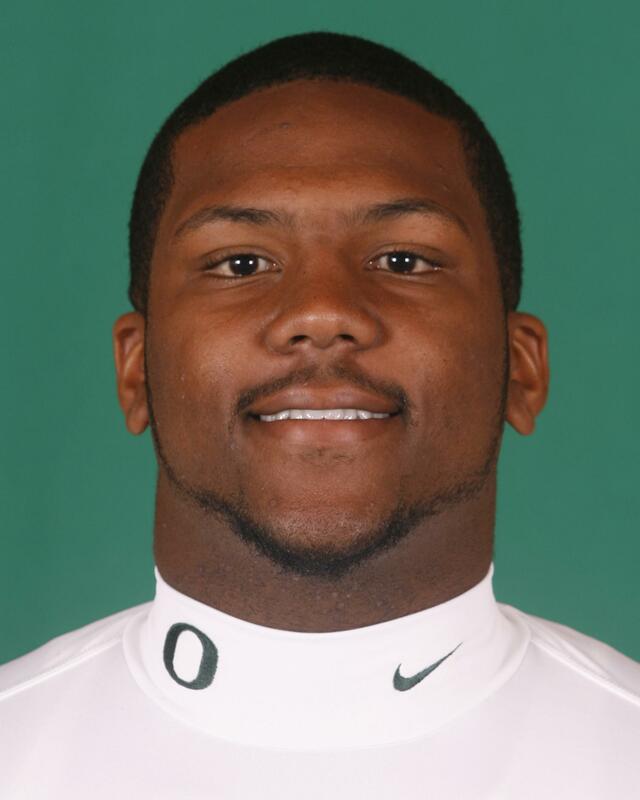 � Injuries to others allowed him much needed reps in the spring, which resulted in great strides. Will benefit from continual improvement in technique, footwook and attention to detail. Possesses the size and athleticism to be successful as soon as he gains a better grasp of his assignments. Expected to accelerate his progression in his second year in the program after shaking off the rust from being away from the game for a two-year religious mission commitment. Spent the majority of his time at left tackle in off-season drills where he emerged among those vying to provide depth along the front line. � Benefited from the experience gained from three years in the program to grab the position in the spring of 2007 and refused to let go while healthy. Exhibited tremendous improvement throughout last season prior to his season-ending knee injury, and displayed the tenacity that encourages coaches to believe he will return to form after being withheld from contact last spring. Possesses traits as a strong competitor and seeks to perfect his play. 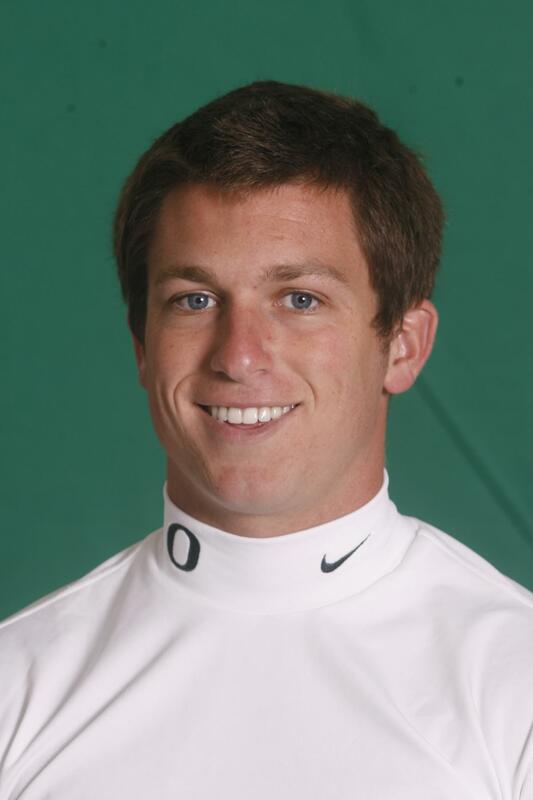 Characterized as understanding Ducks’ defensive schemes better than any other of the team’s defenders, while his intelligence is unsurpassed. Will need to demonstrate he has regained his physical skills early in the fall in order to reclaim his starting berth. His 435-lb. squat was unsurpassed by players at his position in 2007, with his strength hampered in 2008 while rehabilitating in knee injury. � Evolved as one of team’s top defensive end reserves as a redshirt freshman and future only looms brighter. Progress delayed as he missed all of spring drills while recuperating from off-season shoulder surgery, but should alleviate problem in the future. Epitomized by a great work ethic and toughness that leads to continual improvement. Possesses the athleticism needed on the perimeter and already has demonstrated leadership qualities at a young age. Enjoys playing the game but doesn’t shy away from the work that needs to be done in the trenches. Again expected to be one of the top line reserves off the bench. 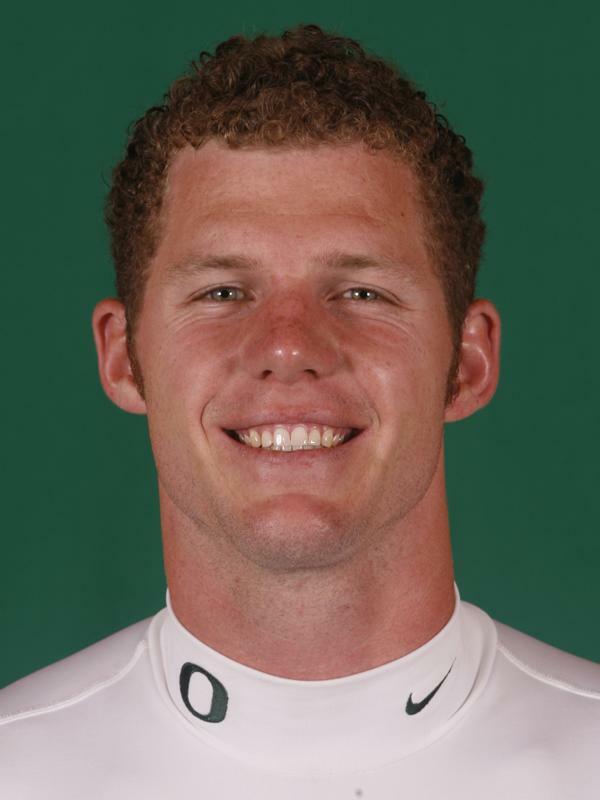 Barker and the Lancers took home the Division II California State Football Championship in 2006. Team ended 2007 season ranked No. 1 in Orange County, No. 5 in California and No. 33 in the nation after compiling a 10-2 overall record and winning the Trinity League Championship. A Mountain Pass League MVP in 2007 while also being selected first-team all-state, First-Team All-CIF and second-team all-county. Named a three-star recruit by both Rivals.com and Scout.com. Played both football and basketball for the Titans. Admittedly, it may be premature after just 15 spring practices to anoint someone for stardom, yet it’s sufficient to say his performance during off-season workouts only further fueled those high expectations. Demonstrated an unsurpassed blend of power with the speed to break long runs, as well as the lateral movement to avoid would-be tacklers in the open field. Exhibited all the traits of a punishing ball carrier who seldom can be brought down by just one tackler. May not make onlookers forget about the program’s departed All-America tailback (Jonathan Stewart) but certainly could ease the transition. The Florida native moves within tight spaces as well as any Oregon running back in the last three decades by utilizing great vision and quick feet. Also uses his size as an asset to immediately emerge as a solid blocker. 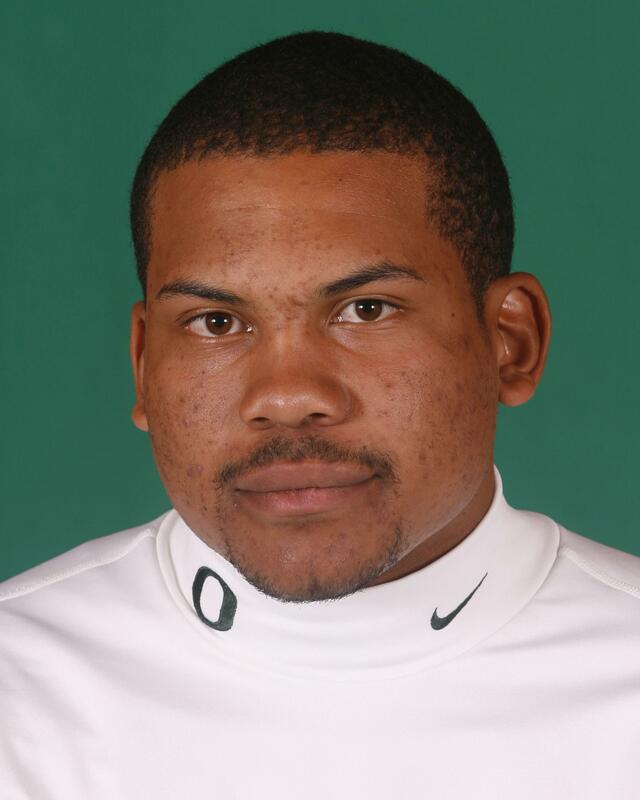 Conjures up images of a bigger and more powerful Reuben Droughns (Oregon’s single-season rushing average leader, 164.8 yards per game). 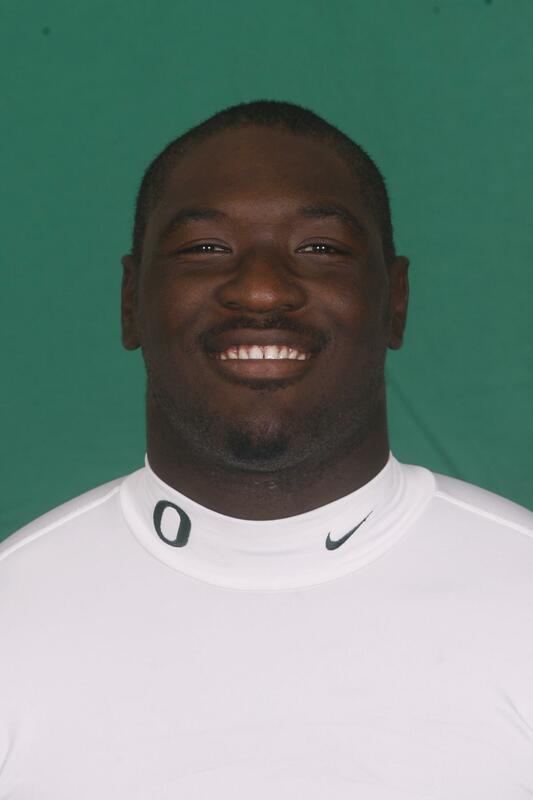 Yet coaches say Blount possesses the same determination but boasts of more power and is a more fluid runner than the Ducks’ previous standout. Carried the football five times for 68 yards in the Spring Game. � Junior season’s post-season honors epitomized strides made by team’s most improved player, yet must strive for continual improvement. Hard work has contributed to his progress as he completed the transformation to linebacker after beginning his collegiate career in the defensive secondary. Demonstrated all-conference caliber the last two-thirds of last season after unseating a returning starter a year ago, and now coaches will expect him to put together a higher level of proficiency for an entire year. Possesses the natural ability to roam from sideline to sideline, with many of his plays under-appreciated when considering where he was positioned when the play unfolded. 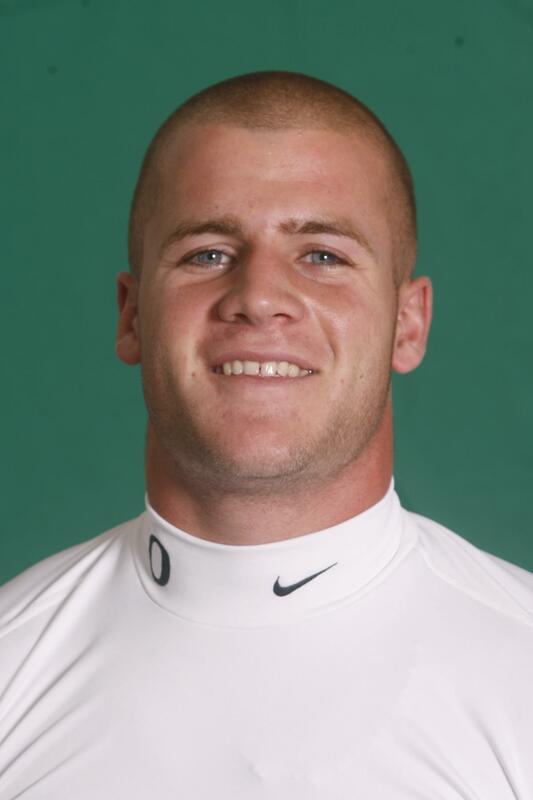 Clocked as Oregon’s fastest linebacker ever over 40 yards in 2006 (4.33) as well as equaled his position’s fourth-best bench press of all time (405 lbs.) last winter. Development hindered by missing all of spring drills with a toe injury so must prove he can make up for lost time in the fall. Emerged as a team leader last year as well as one of program’s most respected in the locker room Despite past accomplishments, remains critical that he returns in the fall in peak condition in order to fend off competition. Graduated from high school early in order to be on hand for winter term and become acclimated to the workout regimen required at the next level. Expected to benefit from the early exposure to the system in the near future, but Ducks can afford to work within his comfort level and not force an accelerated pace. Displayed a solid work ethic and competed well during spring drills but still needs more time to gain a better grasp of the defense. Demonstrated traits as a motivated competitor who possesses an athleticism that will allow him to excel, as well as a physical style of play when he comes in contact with the opposition. Is still learning the position and will benefit from the reps he earns in the fall, which will determine his role as a true freshman. Was credited with three tackles in the Spring Game. 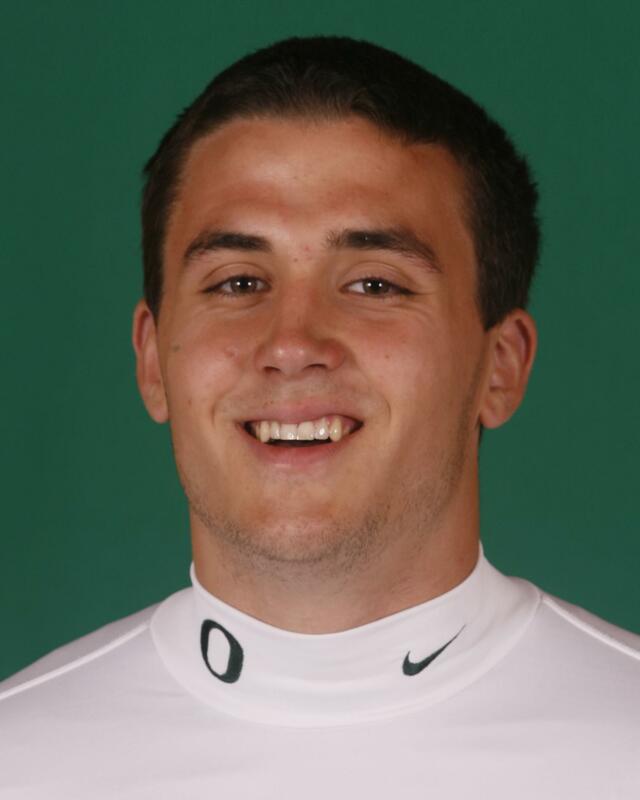 � The walk-on was praised by his coaches as a very, very good football player who will likely vie for special teams duty and could work his way onto the travel squad. Has improved his chances to contribute by working hard in the weight room and utilizing his intelligence. Tallied five tackles and broke up one pass in the Spring Game. 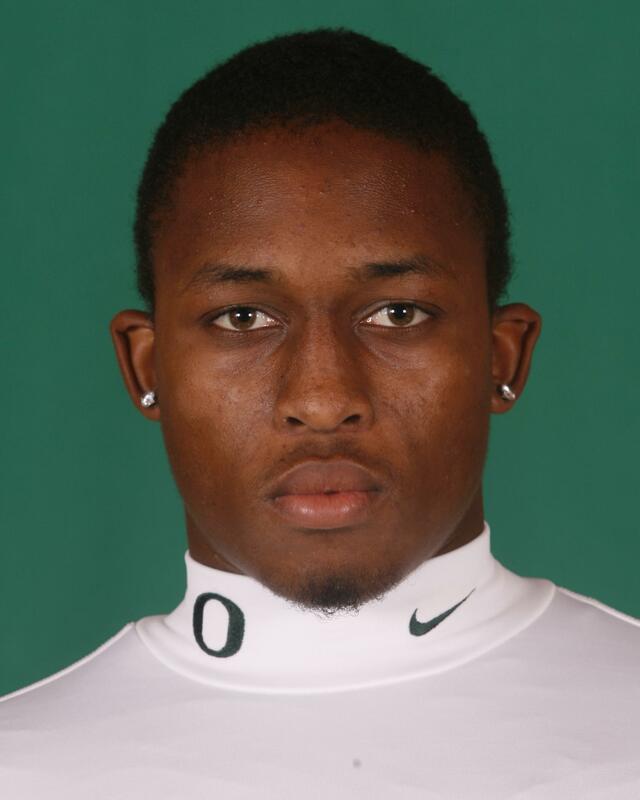 � Experience is one of the keys to being a successful cornerback in the Pac-10 Conference and Byrd begins his third year in that role. But to state the pre-season All-American is merely successful would be a gross understatement. Characterized as an incredible competitor capable of putting a team on his shoulders, he possesses the physical skills of a cover cornerback accompanied by an attitude of someone who hates to lose. Utilizes tremendous awareness when the ball is in the air and maintains the knack for closing on his target in a hurry. 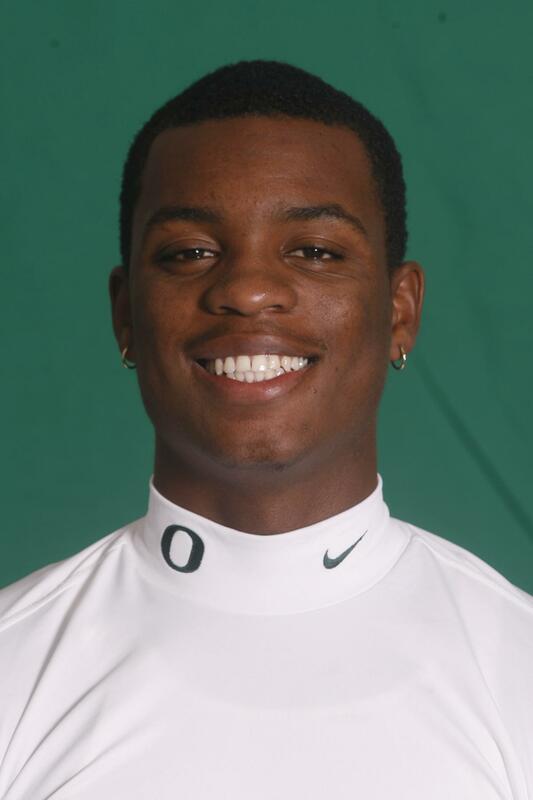 Begins his junior year tied for second in the country in career interceptions (12) among active Bowl Subdivision standouts, as well as already tied for eighth on Ducks’ career list after only two seasons. Is an extremely intelligent player who exhibits a toughness, and has emerged as one of the team leaders. Plays every variation of man coverage well while taking advantage of exceptional size to outmuscle opposing receivers. 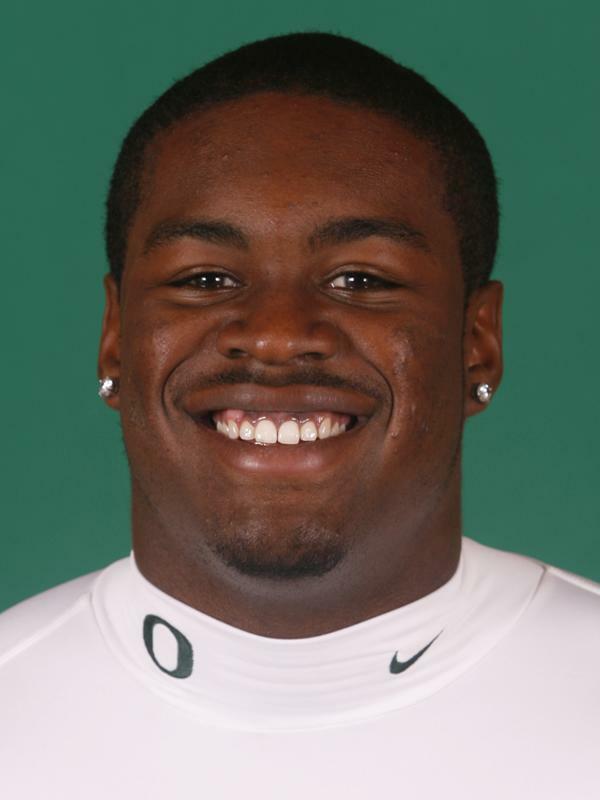 Also a great tackler who forces the corner with an aggressive style, extending his string of consecutive starts to 24. Benefits from tremendous strength as he joined a pair of current teammates in equaling the program’s all-time power clean lift by a defensive back (330 lbs.) during the 2008 winter testing. � Injuries have hampered his development as continued work in the weight room and a better grasp of the offense will pay dividends for the future. Coaches have been pleased with his competitiveness and his mental toughness, yet his misfortunes have made it difficult for him to refine his skills and technique. � The walk-on letterman made a greater presence last year from the line of scrimmage while maintaining his place on special teams. But his development was stymied in the spring due to injuries, which limited his repetitions. His perseverance has paid dividends with his teammates and coaches alike, while his work ethic has earned him opportunities to prove his merit. Characterized as a blue-collar worker who enjoys the game, and is willing to cast aside any ego for the betterment of the team. � Benefitted from the experience gained last fall as a true freshman, yet momentum was unable to carry through to spring drills while being hampered by nagging injuries. Natural strength proved to be his biggest asset a year ago and should be at his best when he learns to rely on his technique and quickness rather than his bulk. Dropped almost 15 pounds from the end of spring drills to the start of summer, which should aid his endurance and accentuate his athletic skills. Completed spring workouts recording 0.5 quarterback sacks among his three tackles in the off-season’s final scrimmage. 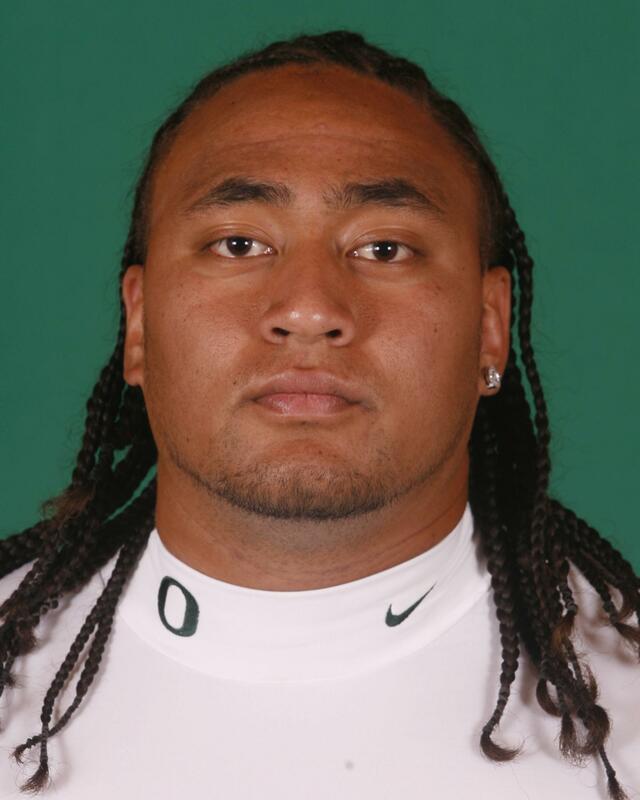 � As the heart of the Oregon defense, the fourth-year starter and three-time all-conference honoree is in position to be as good as anyone in the country. The pre-season All-American has been included on the national watch list for the Bronko Nagurski Trophy (nation’s top collegiate defensive player). First stepping onto the collegiate practice field at the age of 16, he has matured into one of the program’s best defensive backs in the history of the school. In addition, he possesses the extraordinary capability to alter the course of a game through a forced fumble (2), a recovered fumble (1), an interception (8), a blocked kick (2) or a returned punt for a touchdown (1). Combines the instincts and the physical gifts that allow him to cover receivers one-on-one over the middle or bounce outside to help double a receiving threat deep, as well as force the run like a linebacker. Begins his senior season 30 career tackles shy of becoming only the school’s second player to break into the top-10 in career tackles this decade, and 45 tackles from becoming the top defensive back tackler in school history. 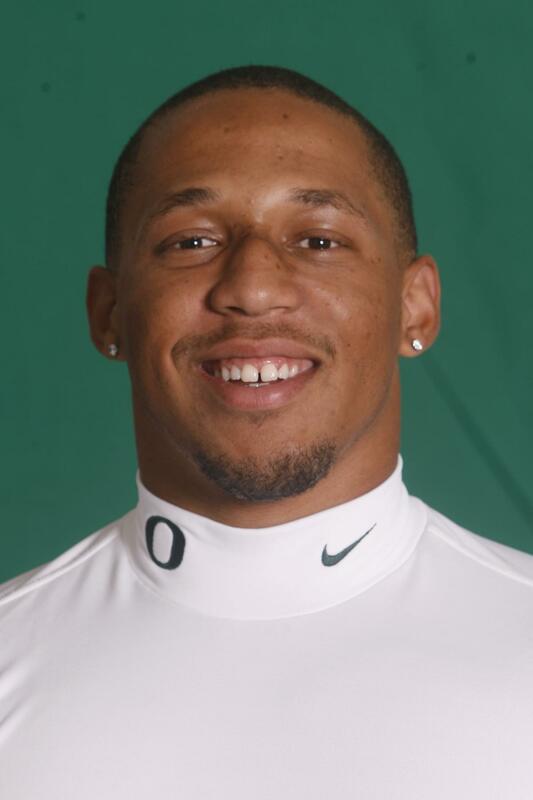 The tireless worker and special player not only has earned the distinction as one of the Ducks’ greatest tacklers ever but also as one of the most unselfish. Despite his status bordering on irreplaceable, he is one of those players who craves added duty on special teams, and would play every snap from scrimmage as well as all four special teams if coaches would allow it. Faring no worse than the team’s third-leading tackler in any one season, missed on only seven tackles his entire junior campaign by his coaches’ count. Has evolved into an exceptional leader by mastering the mental aspects of the game and grasping an understanding of the team’s defensive objectives. 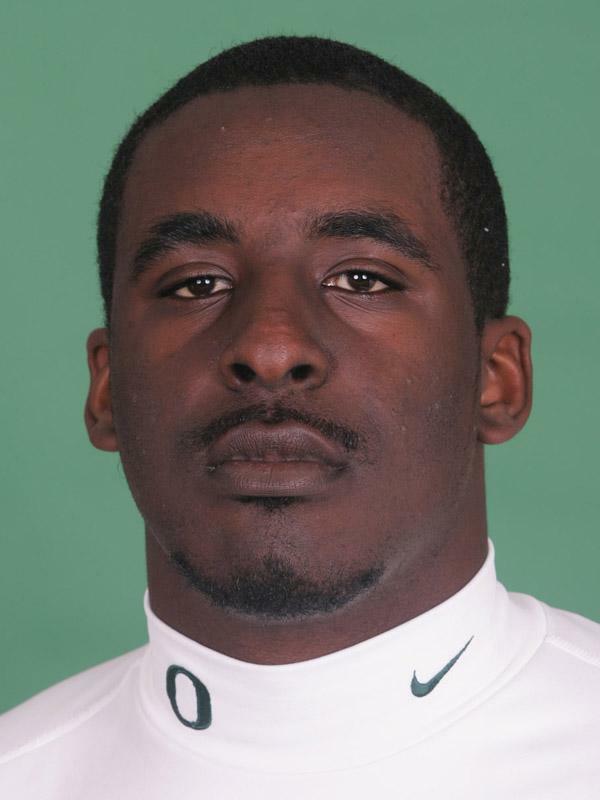 One of Oregon strongest defensive backs, posted the program’s second-best bench press (345 lbs.) 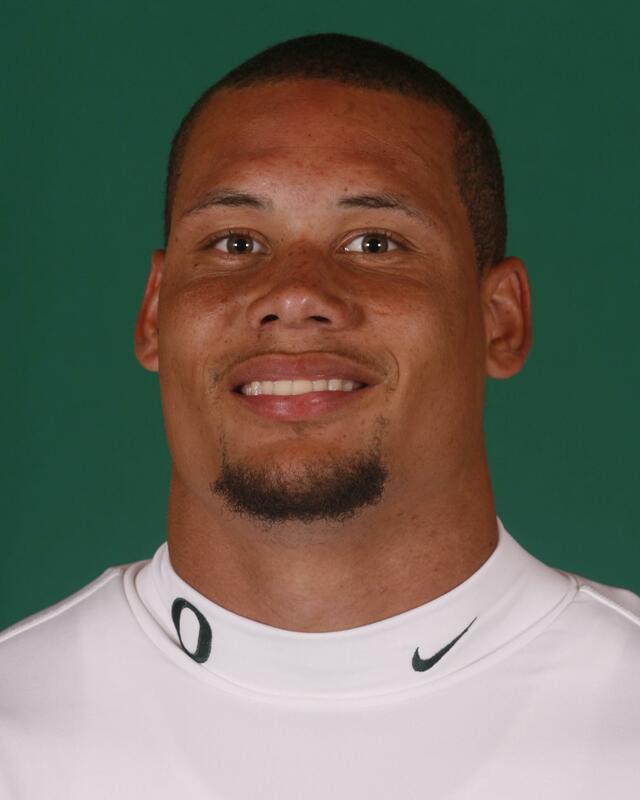 in this year’s winter testing, in addition to the Ducks’ fifth-best power clean lift (324 lbs.) of all time (324 lbs.) among players in the secondary in 2007. 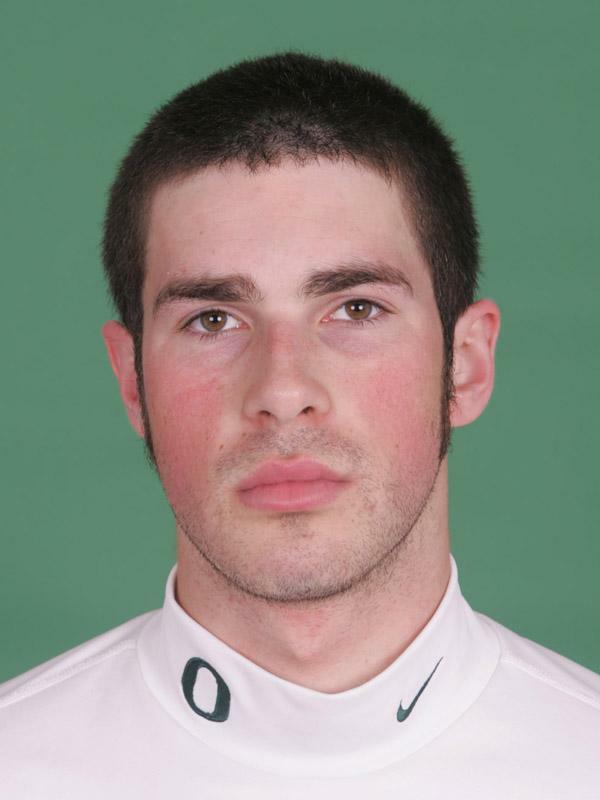 Cody was named All-State, All-Region and All-League in 2006 and 2007. Recorded 58 pancake blocks in his senior season while not allowing a single sack. Also played defensive end in high school. Tallied four letters in football, three in basketball and one in wrestling. 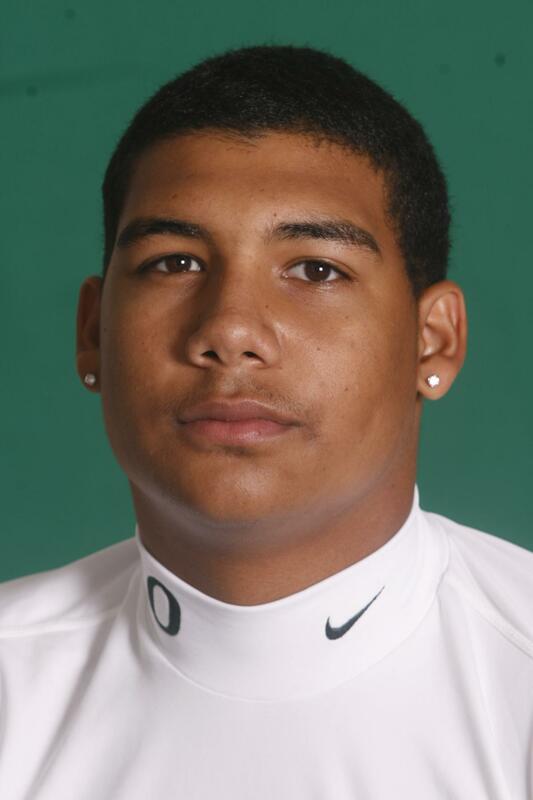 Named a three-star recruit according to Scout.com and was given four-star distinction by Rivals.com. � Emerged from spring drills atop the depth chart despite his restrictions from full contact while rehabbing from last season’s knee injury. Demonstrated a thorough grasp of the offense and would have likely been brought out of last year’s redshirt status last year when injuries to others occurred had it not been for his own surgery. Exhibited a good spring and solid touch during seven-on-seven drills, and provides the ability to keep the chains moving downfield. 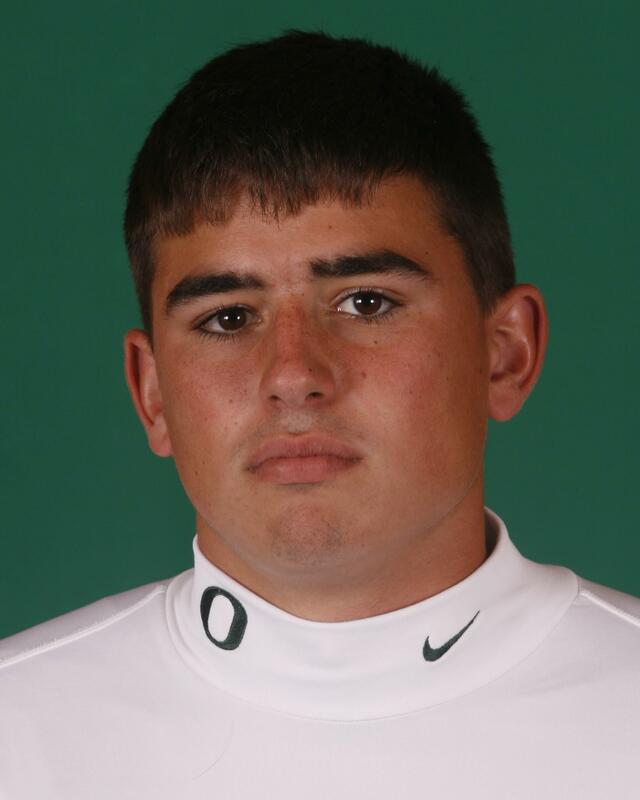 Described as a very accurate thrower who possesses the strongest arm among all the team’s quarterback candidates. Provides a deceptive threat with the football tucked under his arm while possessing that sixth sense and the quick feet to elude pressure in the pocket. Coaches await the fall with great anticipation to see how he performs in the fall with no limitations. Paced all quarterbacks with a 295-lb. bench testing last winter after peaking with the third-best squat totals (425 lbs.) 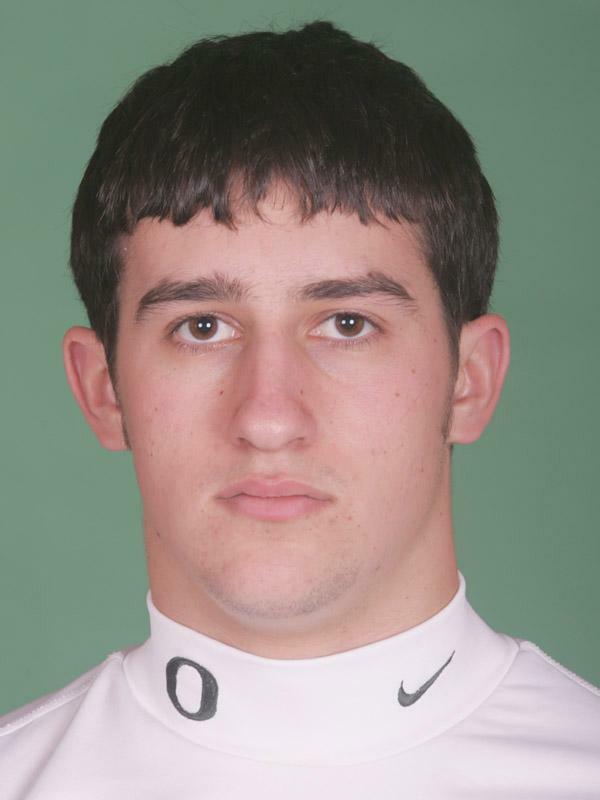 ever among program’s quarterbacks in 2007. 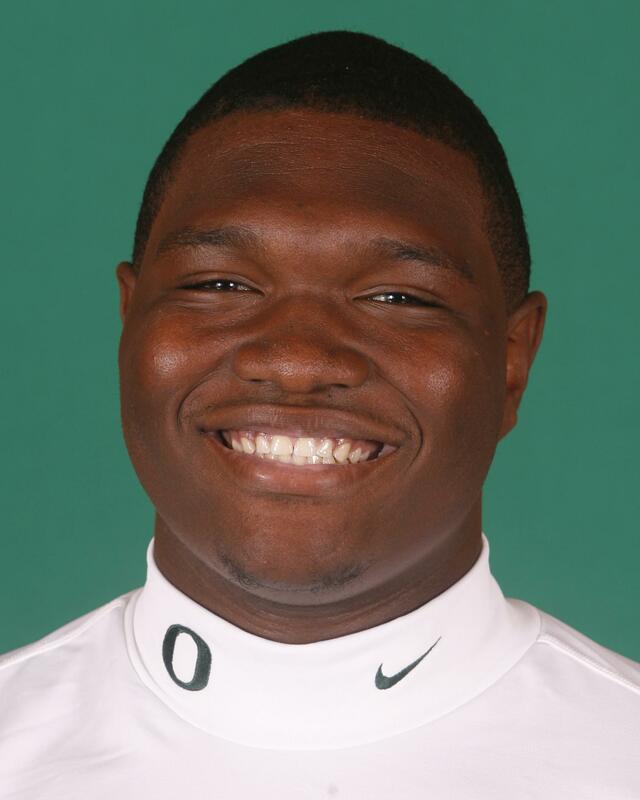 � Whether it be the motivation fueled by the departure of Oregon’s single-season rushing leader or the challenge brought on by incoming talent, Crenshaw is coming off his best spring to date. Perhaps overlooked in the past due to the depth ahead of him, is doing his best to be sure that doesn’t happen again. Improved in almost every aspect of his play in the spring, bettering his foot speed and acceleration, in addition to the tempo in which he plays the game. Understands the offense as well or better than any of his counterparts at his position, and provides the benefit as an accomplished blocker. 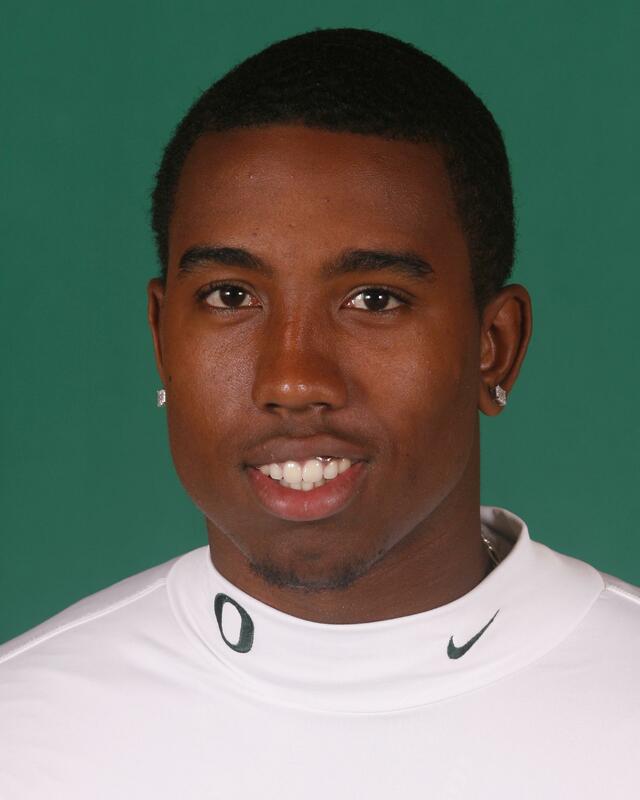 Also thrives as a receiver as coaches not hesitant to split him towards the wide side of the field. Offers the contrast with a slashing running style, yet not afraid to lower his shoulder to deliver the blow. Utilizes his range of vision to scan the open field and look for openings. Carried the ball six times for 25 yards in the Spring Game. 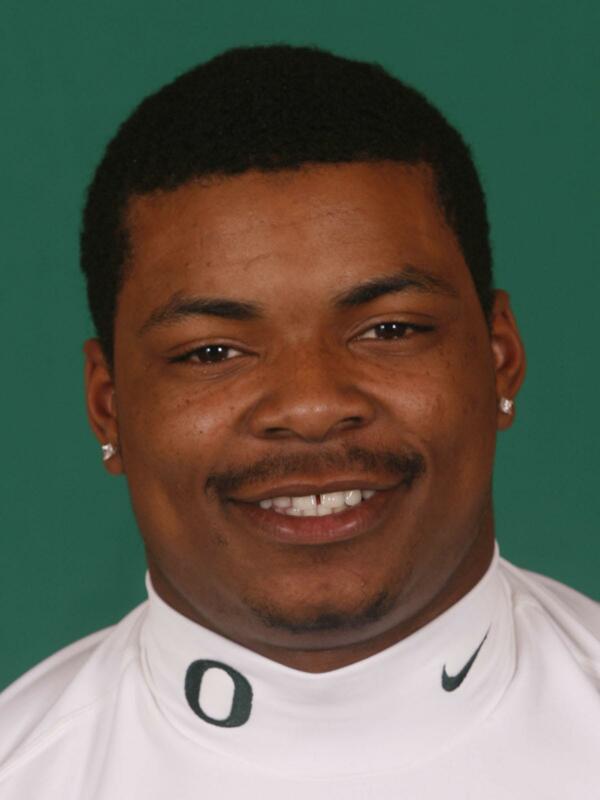 � Benefited from completing his high school graduation requirements early, which enabled him to enroll at Oregon for the �07 spring term and take part in spring drills. Discovered just how much there is to learn at the next level and struggled to make the adjustment early. Yet has demonstrated a mental capacity beyond his years. Was able to identify areas of deficiency from his first fall and concentrated his efforts this spring on improving his footwork and running in and out of breaks. Consistency will be his key to stepping onto the field more his second time around. Considered one of the team’s better blocking wide receivers as a true freshman and certainly was unmatched in that facet in the spring. Now looms the challenge of getting more mileage from him in the passing game and taking advantage of his assets. 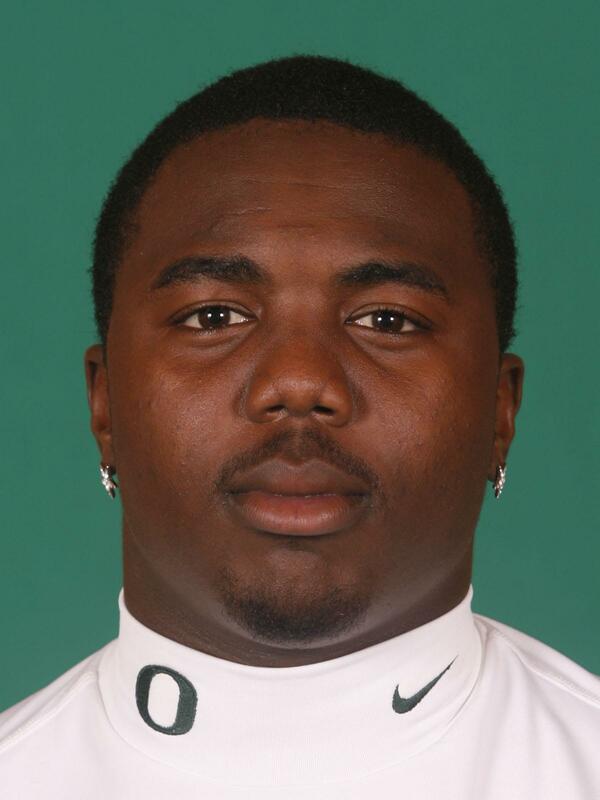 Equaled the school’s fourth-best bench press of all time among wide receivers (325 lbs.) during the 2008 testing. Caught one pass for 20 yards in this year’s Spring Game. � It only took his first full season at tight end for coaches to rave of his endless physical potential that compares favorably with some of the school’s all-time greats at his position, and he accumulated the statistics to support that notion. Caught more passes in 2007 than any other tight end in one season in school history. 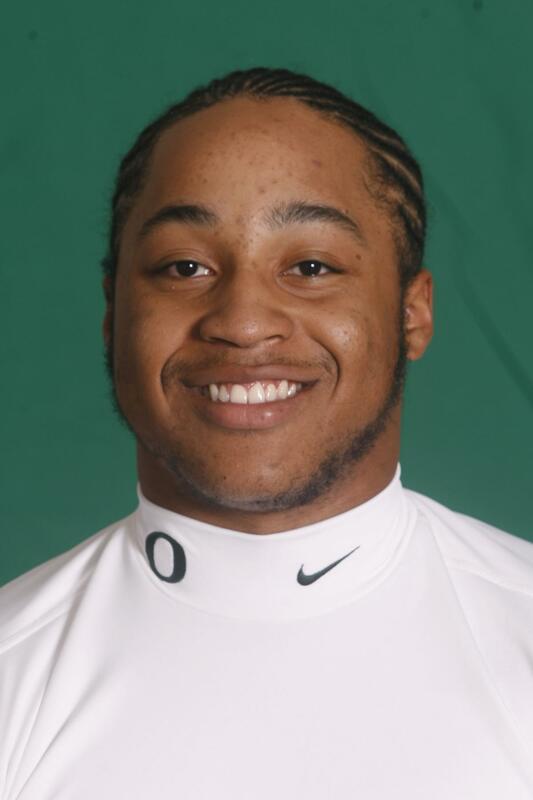 Considered one of the offense’s most improved players during 2008 spring drills compared to last fall after playing on both sides of the football as a redshirt freshman. Has developed an air of confidence resulting from a year of experience under his belt as well as finding a home at tight end. Displayed the maturity expected from a returning starter who has acquired a better grasp of his assignments and an improved knowledge of the game. Possesses tremendous athletic ability and is blessed with great speed that allows him to separate himself from defenders. Was more proficient at catching the ball last season, utilizing great hands and skills as a wide receiver, yet continues to work tirelessly on his blocking skills at the line of scrimmage. One of the program’s strongest tight ends in school history, has emerged as only the second tight end in school history to bench press 400 pounds or more (400 lbs. 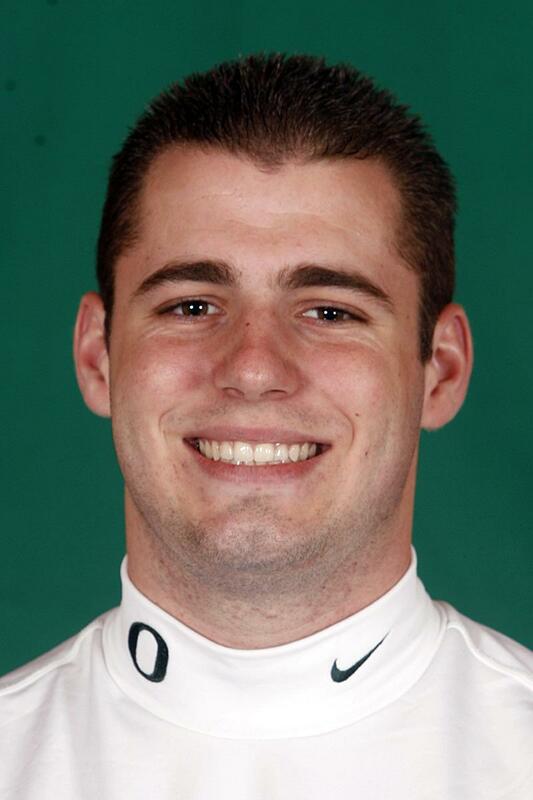 ), as well as tied for second on the position’s all-time power clean chart (341 lbs.) during 2008 winter testing. Caught only one pass in the Spring Game, but he made it good for 67 yards. � Got on the field for two games, making the most of his second appearance by intercepting a pass and returning it 15 yards for a touchdown against South Florida in the Sun Bowl. 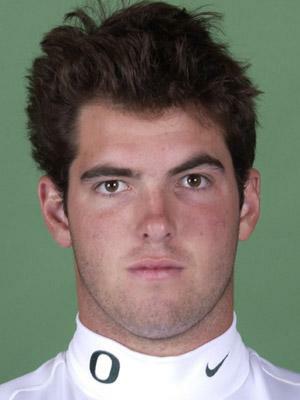 A five-time scout team player of the week, three times on defense and twice on offense. Won GHASA state titles in 2006 and 2007 with Roswell High School. Lettered four times in football for the Hornets, while also lettering in track and basketball. Rated a three-star recruit by both Rivals.com and Scout.com. � After coming off his best season a year ago, the team’s placement and kickoff standout improved his consistency with a great spring, specifically honing his PAT and field goal skills. Made a name for himself as team’s kickoff specialist his first two years before extending his unblemished PAT string to 71 last season, becoming school’s first individual since 2003 to remain perfect in one campaign. Few kickers in school history have possessed more athleticism, which presents the special teams with an 11th defender covering kickoffs downfield. Equaled team’s best among kickers and quarterbacks with a 31.5-inch vertical jump, with only former quarterback Dennis Dixon clocked in a faster electronic 40 time (4.52) among players at the two positions. Utilized a tremendous leg to make the adjustment needed with kickoffs moved back to the 30-yard line last season, as evidenced by connecting on 50-yard field goal in the Spring Game. Enrolled for the start of spring term, yet missed the majority of drills due to an ankle sprain. Characterized as a tough, blue-collar player who possesses very good upper and lower body strength, as well as a solid grasp of the game. Will be crucial for him to make up for lost time during off-season workouts and to enter fall camp in top condition in order for him to make an impact on coaches early. � Patience has been the key for the junior walk-on as he has provided the program with insurance while he waits for his opportunity. Continues to improve on all aspects of his specialty, with his consistency looming as his biggest hurdle. 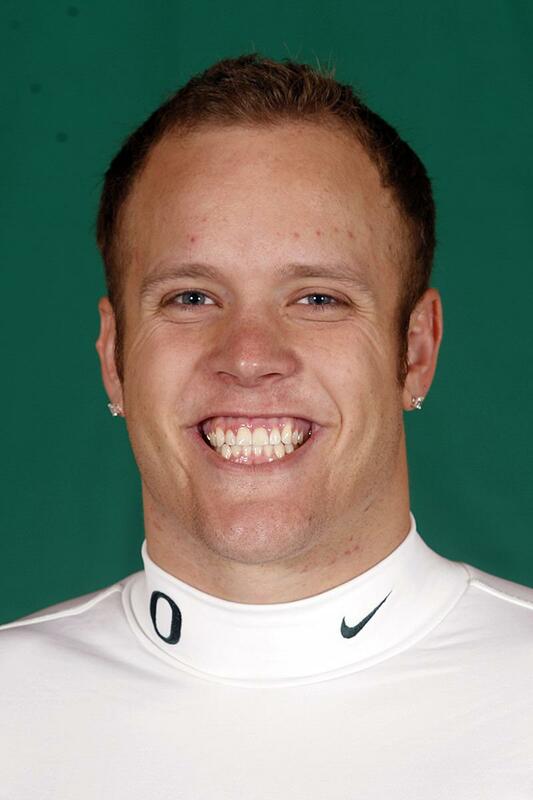 Possesses the best leg speed among all of team’s kickers, which results in the football exploding off his foot better than any of his teammates. 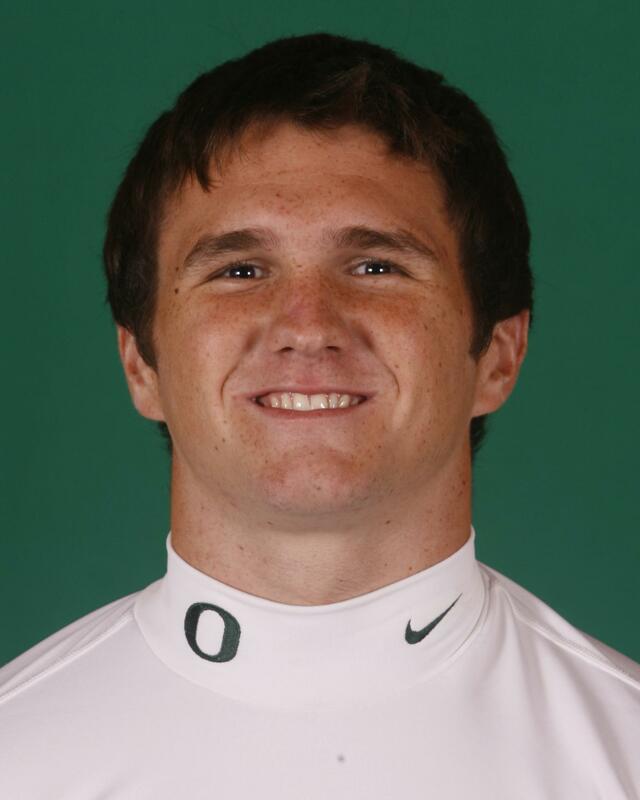 Also has worked his way as the team’s back-up kickoff specialist as he has developed great hang time. 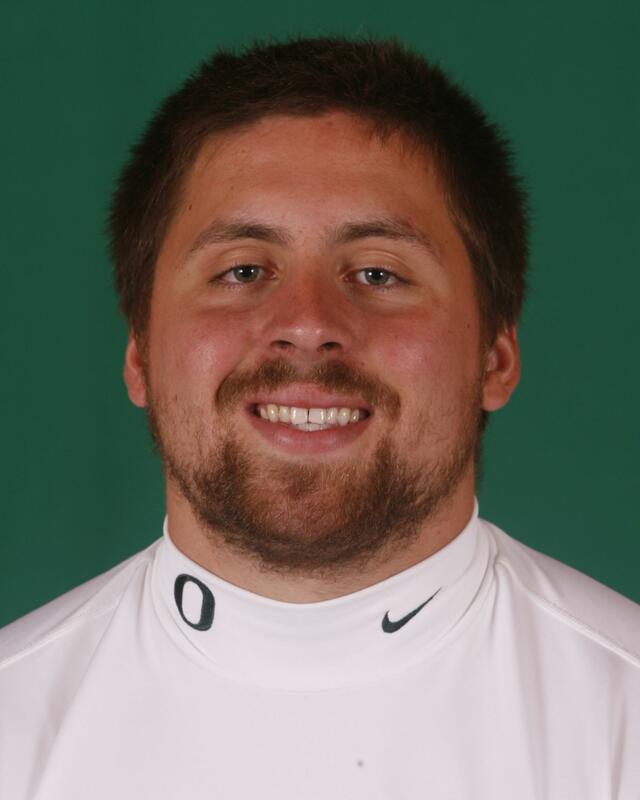 � The walk-on took the field twice despite an abundance of experience and health on the offensive line. Made appearances vs. Fresno State and South Florida, totaling five plays. Received team honors for play on the defensive scout team leading up to the Michigan game. 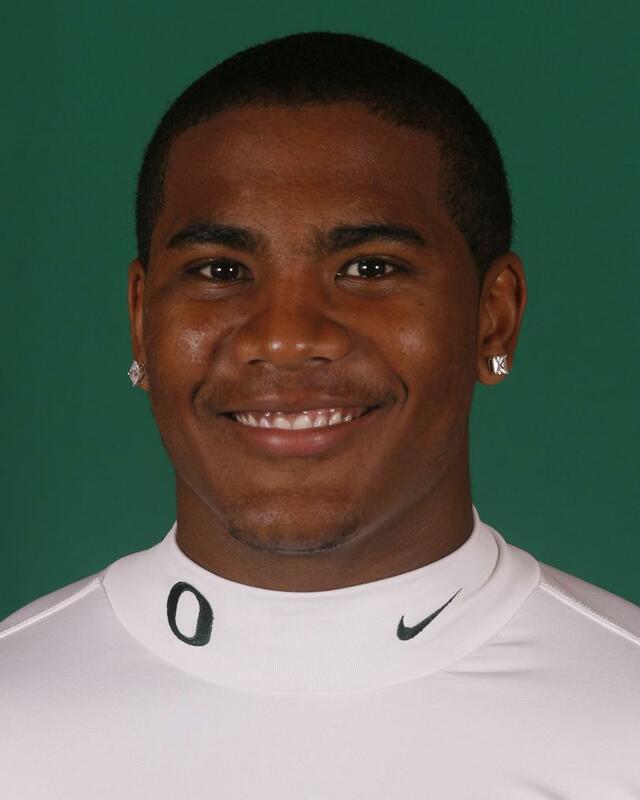 � A very talented individual who is projected to have a great future was thrust into action last year as a true freshman. Coaches wish he could have four years of eligibility remaining as his playing time diminished as the season wore on. Needs to continue developing his physical prowess, which should lend itself to more playing time. Was able to compete athletically with team’s remaining defensive backs yet his lack of experience reduced his opportunities among a gifted secondary. Athletic skills epitomized by 35.5-inch vertical jump equaling program’s fifth-best effort ever among defensive backs and secondary’s top mark in 13 years. Posted one tackle and broke up one pass in the Spring Game. � The veteran reserve has served as team’s first cornerback off the bench for the majority of last two seasons, annually increasing his production during that span. 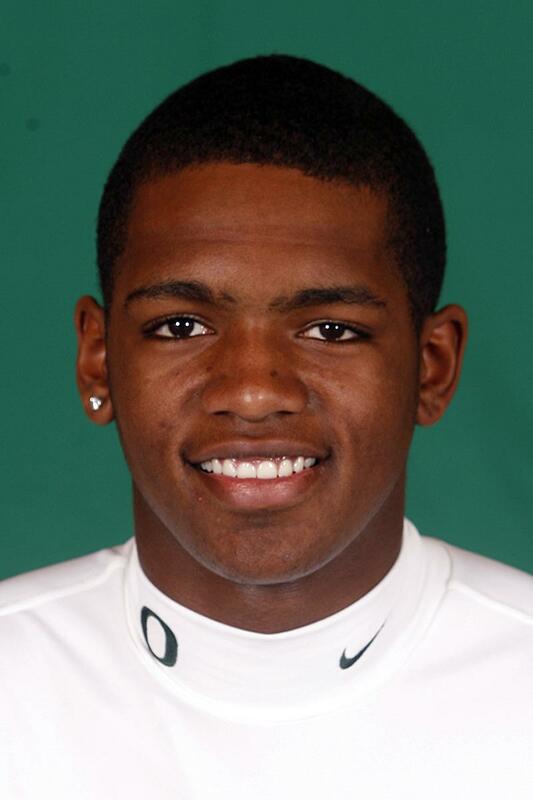 Is a starter of squad’s multiple defensive back packages due to his tremendous quickness and coverage skills. Possesses the potential to enjoy a breakout year at a position that is loaded with all-star talent. The tireless worker was challenged to improve his tackling a year ago and he did, earning himself more opportunities as time goes on. He continually improves as he accumulates more experience. � Converted from linebacker to defensive end in the spring and made a lot strides towards contributing in the fall. Possesses good size and all the physical tools to be successful, with his timetable dependent on how quickly he adapts to his new position. Yet maintains the proper attitude to make the transition and coaches are hopeful he will be able to utilize his quickness in the trenches. The program’s second-fastest defensive lineman (5.14 electronic 40 yards) shared team’s top power clean lift (341 lbs.) 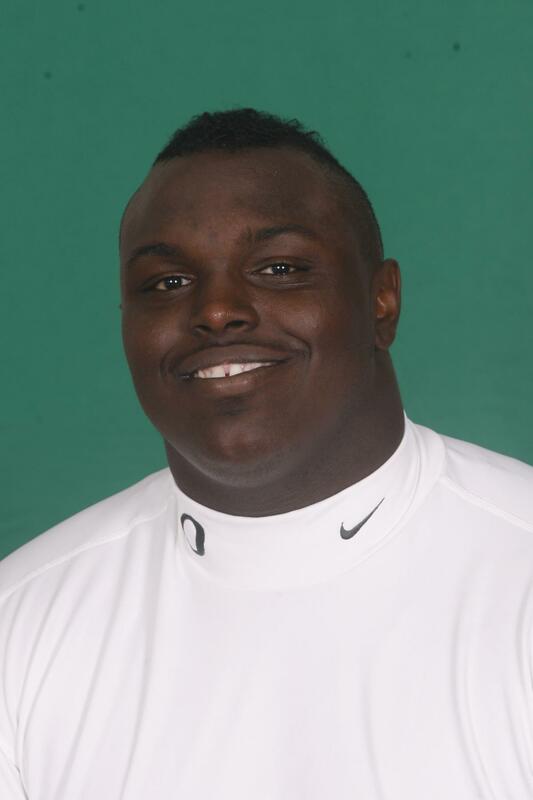 among players at his position during 2008 winter testing, in addition to posting defensive line’s second-best bench press (395 lbs.). Lettered twice in track and four times in football at Tigard High School. Saw time at running back, defensive back, wide receiver and kick returner while on the gridiron. � Has been slowed by injuries since his arrival but has demonstrated ability to play at this level when given the opportunities. Possesses good size and speed to stand out at both the Mike and Will slots, and has exhibited a solid knowledge of the game. Has elicited optimism from his coaches despite limited repetitions yet his health has prevented an accurate evaluation of his status heading into the fall. Was credited with one tackle in the final spring scrimmage. Brings to the mix great athleticism and size, in addition to possessing the threat as a tremendous runner who is light on his feet. Throws the football well despite not playing in a pass-oriented offense at the high school level. Stood out as the one quarterback who improved in each of the 15 spring practices after arriving on campus the day prior to the start of spring drills. Exhibits the ideal demeanor for the position and grabbed coaches’ attention for his outstanding poise for a player of his age. 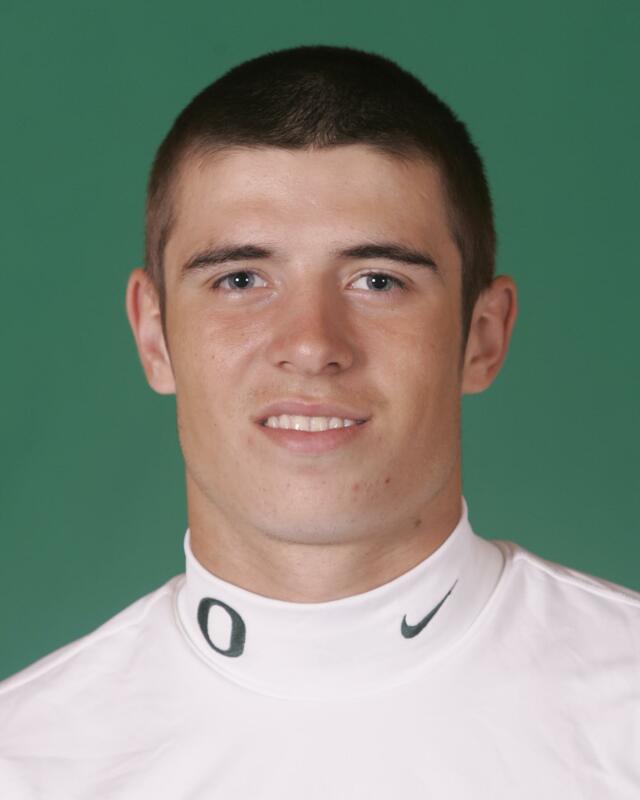 Graduated early from high school and enrolled at Oregon during the spring quarter. Completed two of nine passes for 73 yards in the Spring Game in addition to running for 67 yards on 14 carries. � With his senior season before him, could be ready to break loose for the year coaches have been waiting for after coming off a great spring showing. Worked through practices despite being slowed by a hamstring ailment. Possesses all the physical tools to rank among the league’s best defensive tackles but must play at a consistent level on every snap. Exiting spring drills atop the depth chart, maintains the power to control the inside of the line of scrimmage. Coaches have gone so far as to say he has the potential to be the key to team’s defensive success. Has reached a new level of maturity that could motivate others to be successful, and has emerged as one of the leaders in the weight room. Shared the team’s top bench press pinnacle (415 lbs.) regardless of position, and in addition to equaling the best power clean mark (341 lbs.) 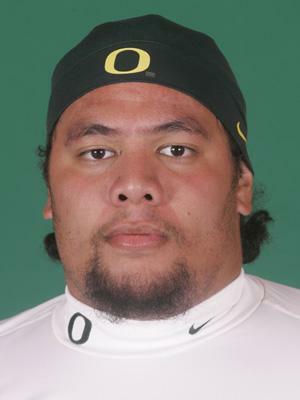 among Ducks’ defensive linemen. Has welcomed the challenge to give his best effort every week and improve his consistency. Was credited with three tackles in the Spring Game, including 1.5 tackles for loss, in addition to returning an interception 5 yards. � Injuries last fall prevented him from improving his game but he was given every opportunity to make up for lost time in the spring. Blessed with tremendous speed, he will be challenged to grasp the offense in a short amount of time in the fall in order to make an immediate impact. Possesses the dimension as a game breaker but it will be up to him to take advantage of the opportunity. His absence of playing time the past two seasons has impacted his consistency. Certainly possesses a tremendous upside if he can focus on improving his attention to detail. Displayed a willingness as a blocker and the concentration to catch the football. Now needs to continue his work in the off season and demonstrate the ability to transfer his play in practice to game situations in the fall. The team’s fastest player (4.51 40) carried the football once for 9 yards in the Spring Game to emerge from the off season fighting for a starting berth. 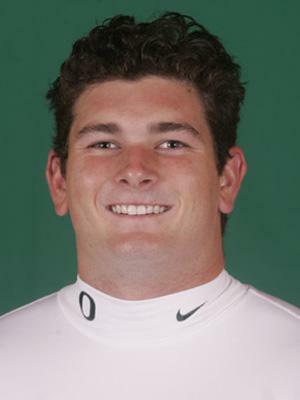 � Provides the Ducks with another option at both center and guard who brings an element of physical intensity to the table. Needs to continue to work on his quickness and explosion in order to take full advantage of his technique as an alternative to always attempting to out-muscle the opposition. Provides an air of maturity for a player with three years of remaining eligibility, and carries himself well on the field in pressure situations. Slated for significant playing time in the trenches as a starter or often-used reserve, with a fast start at the beginning of fall camp key to establishing himself a spot in the rotation from the outset. � Made great strides during the off season, improving his strength levels and his athleticism. Still can improve in those areas to enable him to operate from a more powerful posture. Demonstrated an improved level of assertiveness on the field last spring, assuming greater leadership responsibilities and taking charge of others around him. Would take it upon himself to verbalize adjustments in blocking schemes, and displayed increased levels of maturity which weren’t so apparent in the past. If he continues to improve physically prior to the start of fall camp, he could put himself in position to play a greater role at either tackle spot. 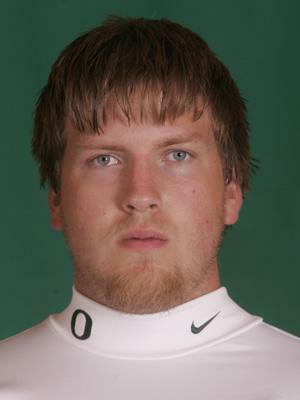 Exited the spring atop the depth chart at right tackle. 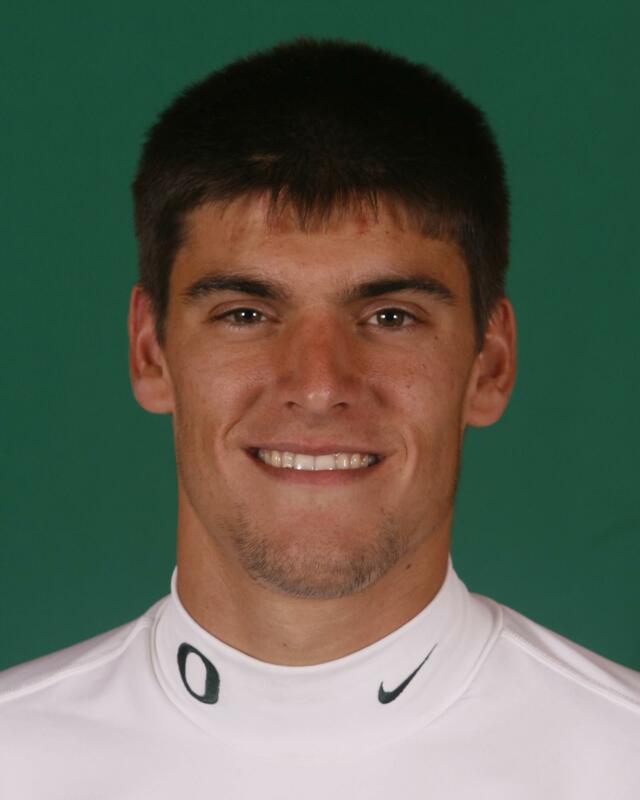 � Has lettered each of the past two years primarily based on his efforts on special teams and that again will likely be his role in 2008 unless he quickly turns heads early in fall camp. Utilizes his intelligence both on and off the playing field, and expected is a dependable athlete and hard worker. Possesses a tenacity and determination that could result in in more playing time, but the depth in the secondary makes for many obstacles to clear. � As is often the case with first-year freshmen, first attracted coaches’ attention through play on special teams before his performance earned an expanded role. Displayed level of talent that should prompt more time onto to the field in multiple defensive back packages and continued special team opportunities. Calm demeanor is consistent with what is required for players to be successful in the defensive secondary, with his confidence in his own abilities also an asset. Buoyed by his maturity and solid work ethic, is an extremely intelligent individual who prides himself in being in the right position to make plays. Has learned to play at a high intensity level on a consistent basis at a young age, which should fuel opportunity to become a regular in the rotation in the near future. 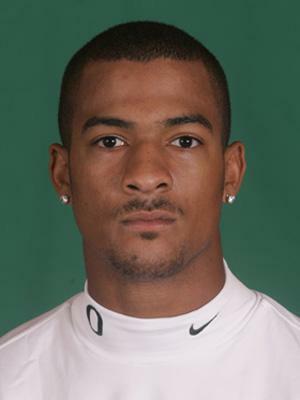 Clocked as team’s fastest defensive back during 2008 winter workouts, finishing the electronic 40 yards in 4.65 seconds. An all-state selection following his junior and senior seasons. Set city season and single game rushing records with 2,043 yards and 322 yards, respectively, following his senior year. Won the 100 meters at the state track meet in 2006 with a time of 10.51. Will also run track at Oregon. 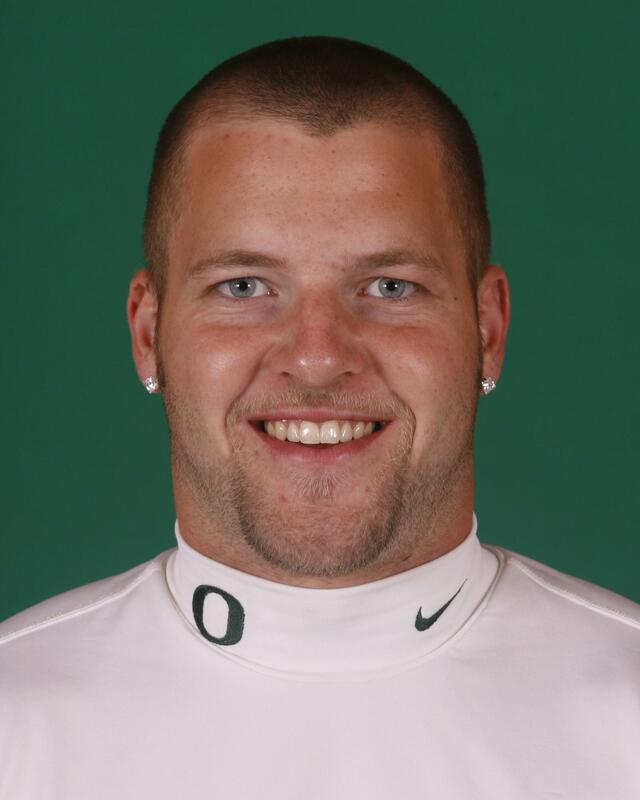 Helped lead team to football state title in 2006. Named a four-star recruit by Rivals.com and earned a three-star ranking from Scout.com. 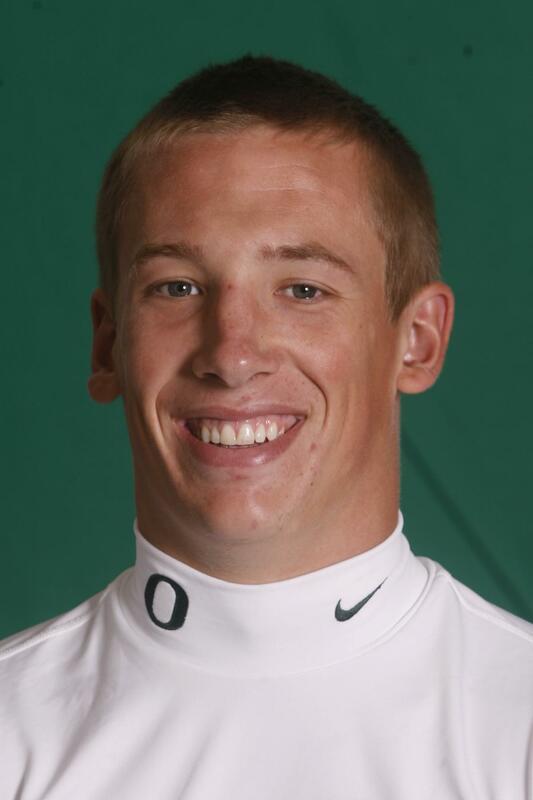 � Some point to the loss of a starting quarterback as the beginning of the derailment of Oregon’s 2007 national championship and Heisman Trophy hopes. But others date the decrease in offensive productivity almost one month earlier when an all-round running back was lost for the season with a knee injury ... the quarterback’s absence merely unmasked the deficiency. 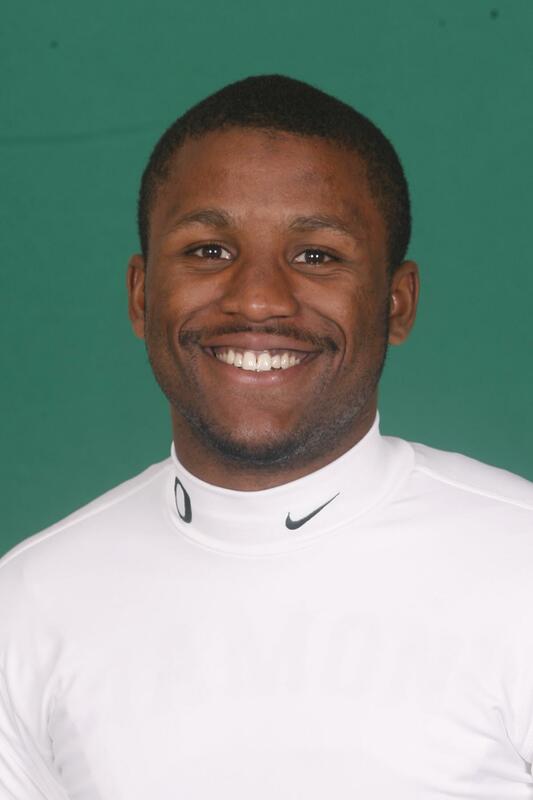 Although Johnson’s numbers exceeded 41 percent of his All-America running mate’s at the time of his injury, his presence on the perimeter created some of the space for Jonathan Stewart to operate. Has tallied 110 points as a collegian, scoring a touchdown for every 11.6 times he has touched the football from the line of scrimmage, and has accounted for TDs in 13 of 27 appearances (including four multi-touchdown games). 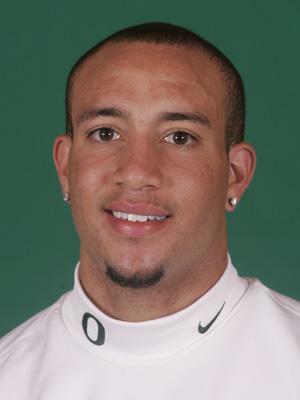 The return of a healthy Johnson would alleviate many of the questions surrounding Oregon’s 2008 running attack. If spring appearances hold true, looks to be completely recovered from last season’s surgery despite being withheld from all contact drills as a precaution. Expected to pick up where he left off last year, and possibly a step faster. Benefits from great vision, which adds to his elusiveness and change-of-direction. Is equally as dangerous a threat as a receiver, which accentuates his flexibility by lining up anywhere on the field. 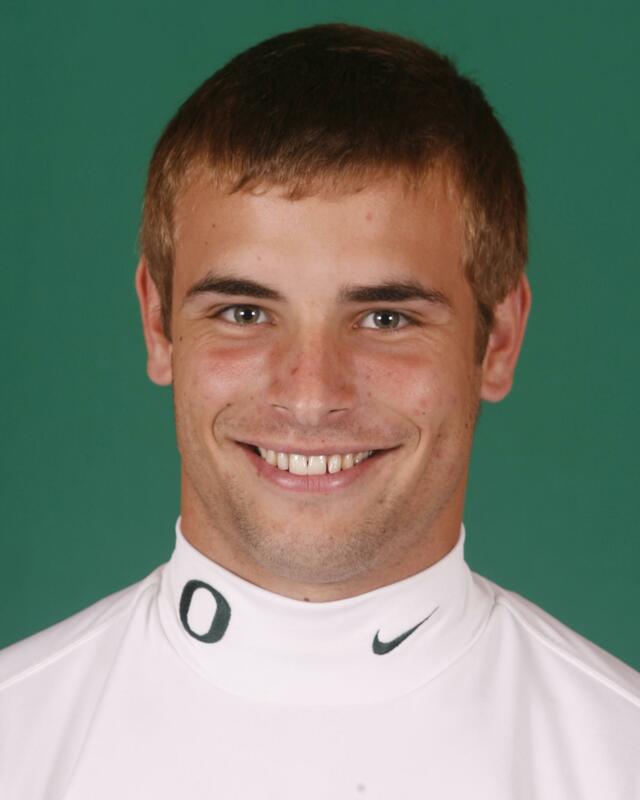 Possesses a great understanding of the passing game that allows team to employ more than one running back in the game at the same time in the Ducks’ one-back offense. Accumulated 228 receiving yards on 28 catches over the course of his last three years, scoring his first touchdown via the pass a year ago. Also added 625 yards (21.5 avg.) on 29 kickoff returns his first two seasons, yet did not return any kicks as a junior. Boasts as the program’s fastest running back through 40 yards (4.66). No trait is better associated with him than the lost art of his stiff arm as he consistently is able to gain additional yardage after contact. � Another of program’s special teams standouts who may be ready to expand his repertoire to include regular duty from the line of scrimmage. Has completed the transition from prep offensive standout with a strong spring showing, and possesses the physical traits that could translate into becoming an impact player. Benefits from the mentoring from one of the nation’s best rovers as he is still learning the position. But once he gains a command at reading his keys, he could become outstanding in his own right. His biggest asset is his strength as he joined two of his teammates in equaling the program’s top power clean mark (330 lbs.) ever among defensive backs, and led the way in the secondary with a 350-lb. bench press during winter testing. 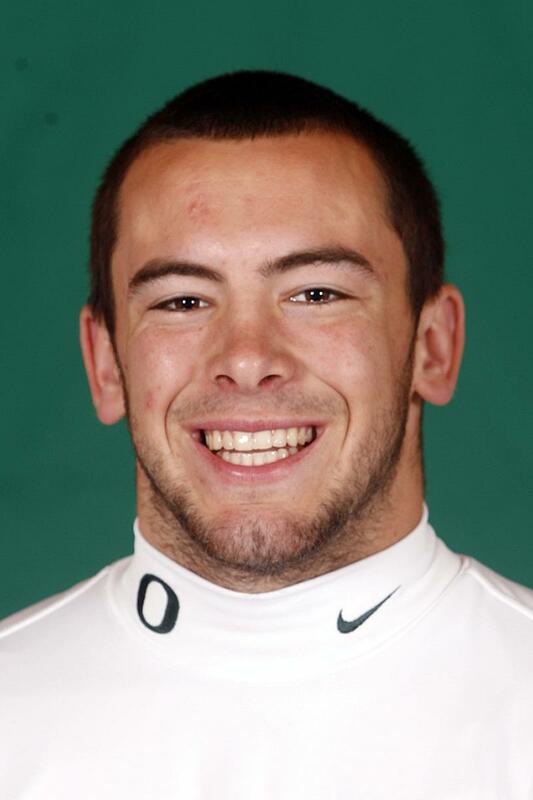 Shaved 13-hundredths of a second off his electronic 40-yard dash time (4.79) from a year ago. Is learning to become a great tackler and needs to improve his consistency. But has made strides in his man-to-man coverage skills and can become a tremendous asset with his ability to track the ball in the air and finish the play. Characterized as one of the program’s toughest individuals, draws rave reviews for his play on all four special teams and its second-leading tackler. Should be in the mix for extensive time on multiple defensive-back packages if he progresses at the same rate in the fall. Earned four letters in both track and football at Chandler High School. 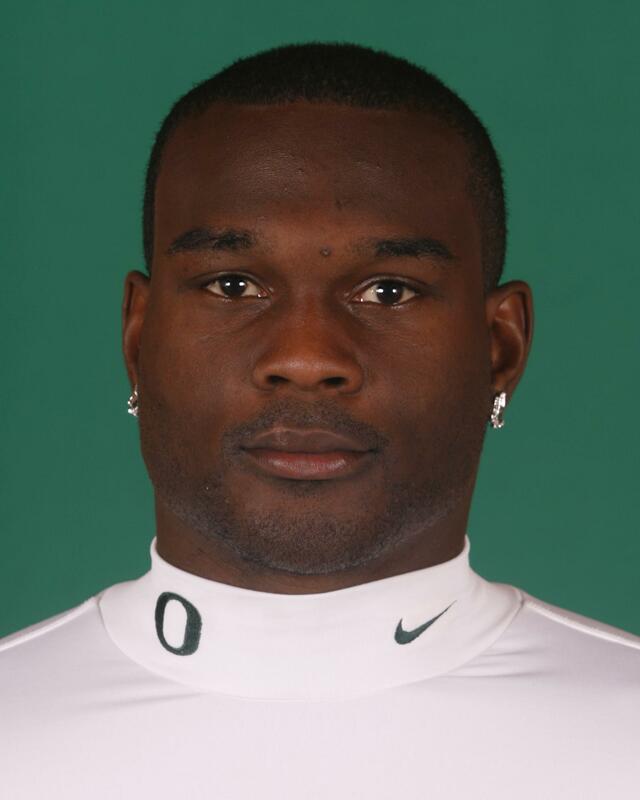 Played tight end and defensive end on the gridiron while competing in the 300 meter and 110 meter hurdles on the track under head coach Eric Richardson. Took home two state track and field titles for the Wolves. Named a four-star recruit by both Scout.com and Rivals.com. 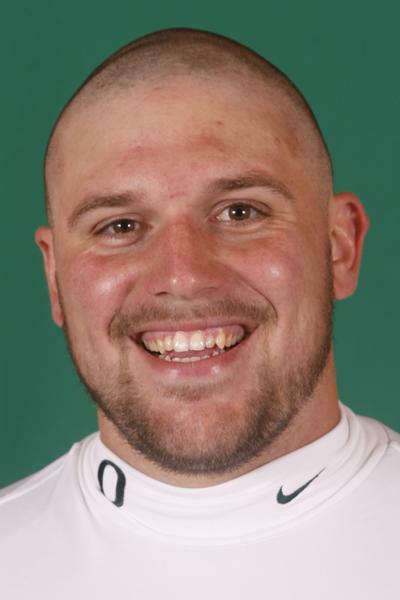 � Oregon’s most improved offensive lineman throughout spring drills has positioned himself as one of team’s top five interior stalwarts heading into the fall. Yet must continue his intensity during the off-season and early in fall camp in order not to relinquish the progress he has made. Has achieved great strides in his learning curve and technique, particularly as it relates to the program’s running game, as well as gained a much better feel in pass protection schemes. Spent the majority of time during the spring at left tackle while filling in for the injured incumbent starter, yet provides the luxury of being able to play on either side of the line as well as both guard and tackle. Strength obviously is one of his greatest assets as he eclipsed 16-year-old record, posting offensive line’s top power clean lift (374 lbs.) of all time during 2008 testing. � Bolstered the team’s preparations for games against Michigan, Fresno State, Stanford, California and UCLA as the scout team player of the week on special teams. Nearly called upon to take practice snaps at quarterback after the top three signal callers were lost for the season. 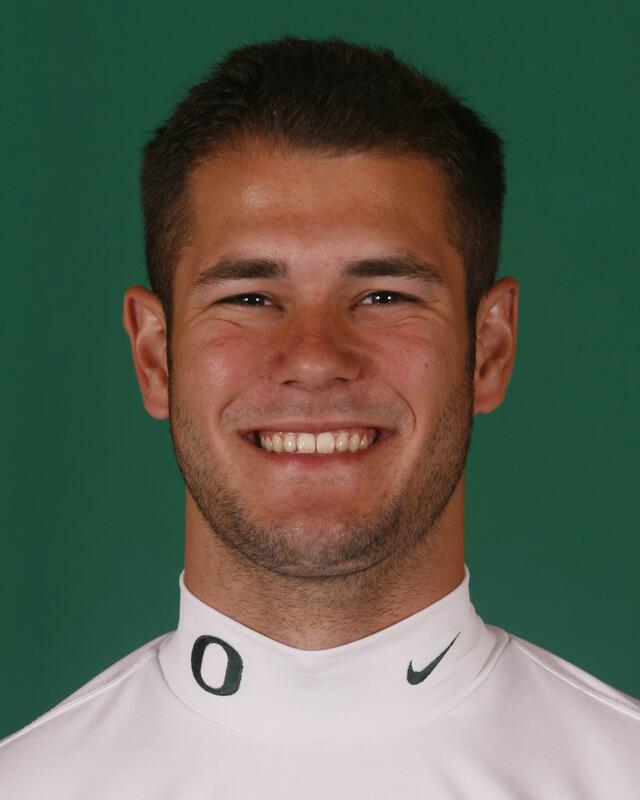 � Has provided the Ducks a veteran presence in a reserve role in the past and now in position to benefit from that experience by expanding his contribution. 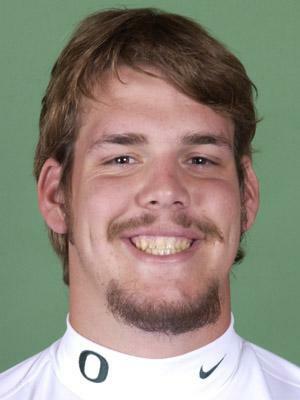 Improved tremendously in the off-season and finds himself in the mix for extended playing time at center and left guard. His versatility remains one of his biggest assets as he greatly improved his strength and physical play. Acquired a more aggressive demeanor since last fall and strengthened his mindset to be able to attack his challenges head on. Also doubles as a candidate to handle snaps in placements and punting situations, as well as the athleticism to play tight end in situations that call for additional blocking prowess. � No one outworks or is more respected than the walk-on and two-year letterman who is an asset to the program beyond any statistical analysis. 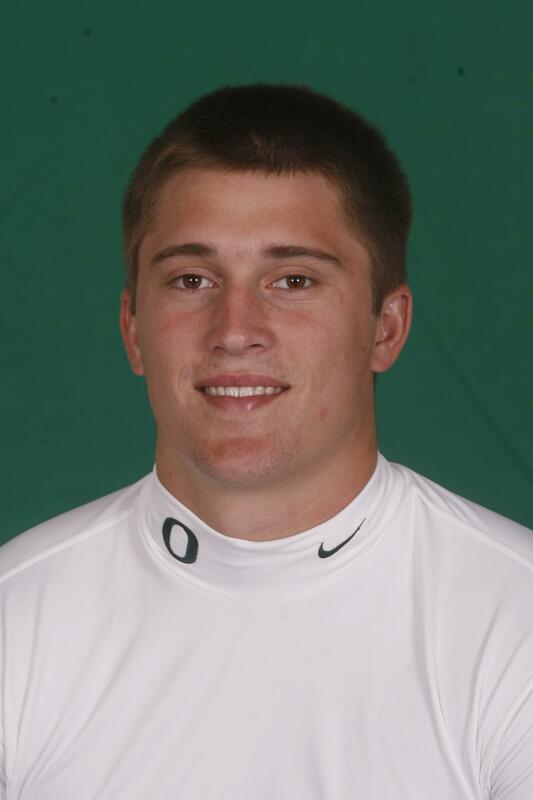 Is epitomized by a strong work ethic and perseverance that has resulted in him forcing his way onto the playing field. Is an extremely intelligent stalwart who has emerged as a leader by example. Makes very few mental errors and has developed a knack for accomplishing the minute details that often are the difference between winning and losing. Demonstrates a toughness that resulted in him being chosen by his teammates as one of the squad’s off-season leaders. 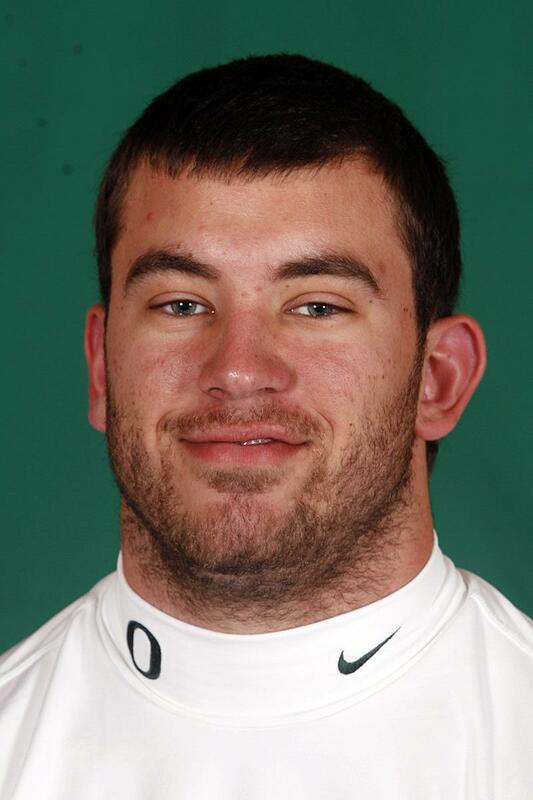 Equaled the program’s sixth-best power clean mark ever by a tight end (324 lbs.) during 2008 winter testing. 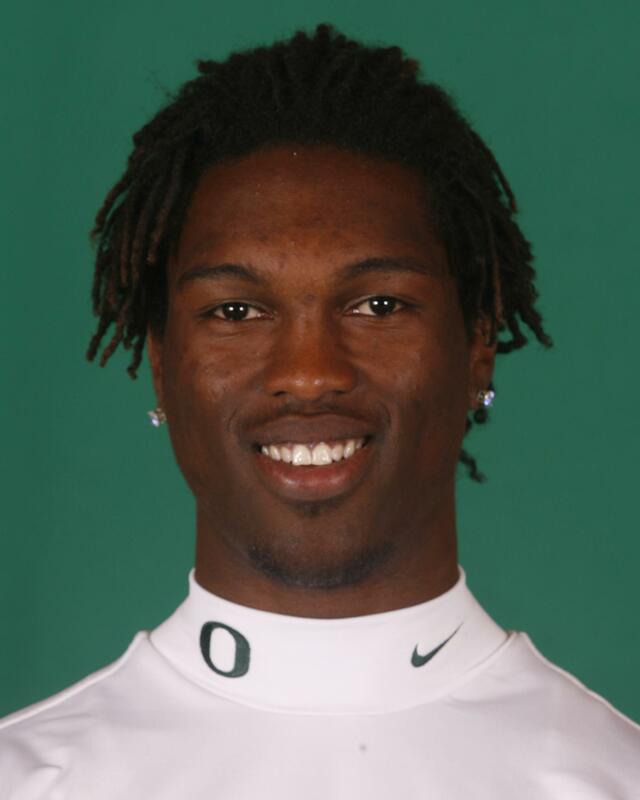 � Coaches fortunate to be afforded the luxury of redshirting the talented defensive back, who was a late signee in the school’s 2007 recruiting class. Characterized as extremely intelligent and understands the game while displaying the poise beyond his years. Demonstrates a strong will to succeed along with a toughness that enables him to be a big hitter. Has been compared in some ways to four-year NFL veteran Keith Lewis, which elicits big expectations from him in the near future. Should gain the opportunity to display his talents on special teams this season with continued hard work. Credited with three tackles in the Spring Game. � The development in his game since the spring of 2007 has been unparalleled on and off the field as the 13-game career starter has developed a demeanor as a veteran leader. Has advanced his mindset beyond the point of just settling to be a starter to looking for ways to improve all facets of his play. His work ethic and attention for detail were among his biggest strides made in the spring as he paid close attention to his footwork and pass sets to enhance his technique as a block. Has yet to receive his share of attention compared to some of the program’s higher profile offensive linemen, but remains a good football player and underrated in his own right. Posted program’s third-best back squat of all time (580 lbs.) 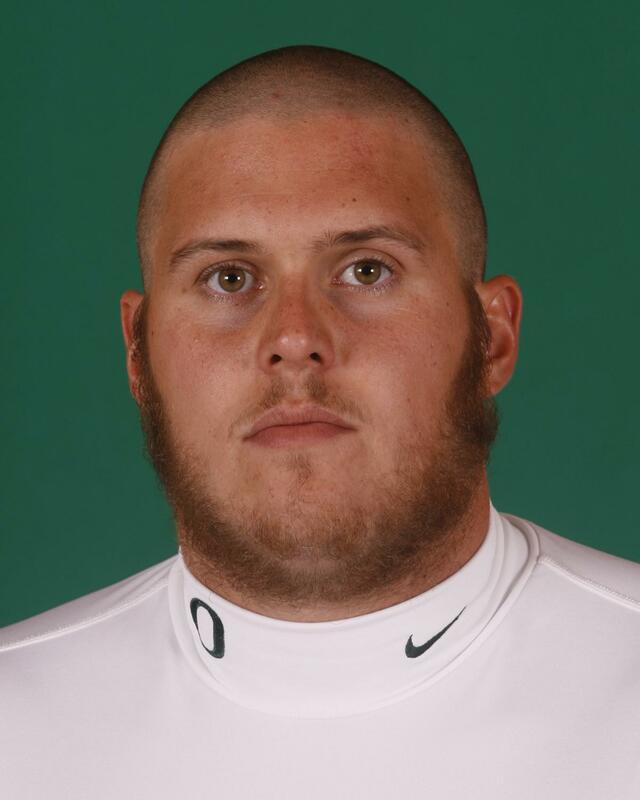 among Oregon’s offensive linemen. 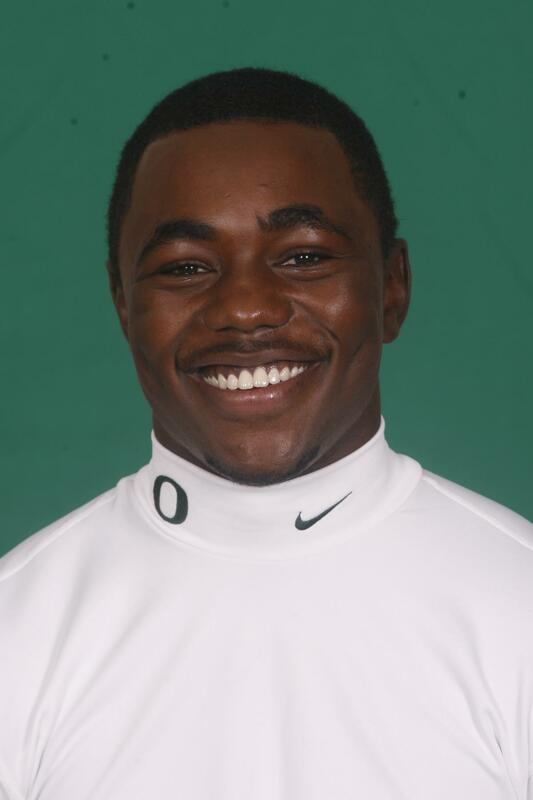 The three-time NCAA regional qualifier posted an outdoor personal best in the shot put (56-7 1/2) for Ducks’ Pac-10 championship track & field team in addition to ranking fifth all-time on school’s indoor chart (56-4 1/2). � Attempting to master a new position after the former prep linebacker and running back was shifted to H-back after the start of camp last fall, demonstrated tremendous strides during 2008 spring drills. Benefits from extraordinary athleticism and very good speed as team’s fastest tight end/H-back (4.82 40 time), with the all-around talent presenting match-up dilemmas for opponents out of the backfield or as a slot receiver. Still developing his skills as a receiving threat, with consistency expected to improve as he continues to gain more experience at a new position. Most effective off the line of scrimmage but could expand his role as he increases his strength and blocking technique. Caught one pass for 53 yards in the Spring Game. � Program’s most experienced defensive tackle has positioned himself for an outstanding senior season as he will benefit from 12 career collegiate starts under his belt. Dropped close to 20 pounds since the end of last year to enhance his endurance as well as combat past injuries that have diminished his effectiveness. His peak conditioning resulted in his best spring of his career and improved movement which allowed him to make plays. Utilizes an outstanding grasp of the game to anticipate the opposition’s motives and possesses the motivation to push himself to get better. An intense competitor who thrives on consistency, he is expected to open the fall as one of the starters at defensive tackle. Relies on sound technique and fundamentals to gain an edge over the opposition, and possesses a relentless work ethic. 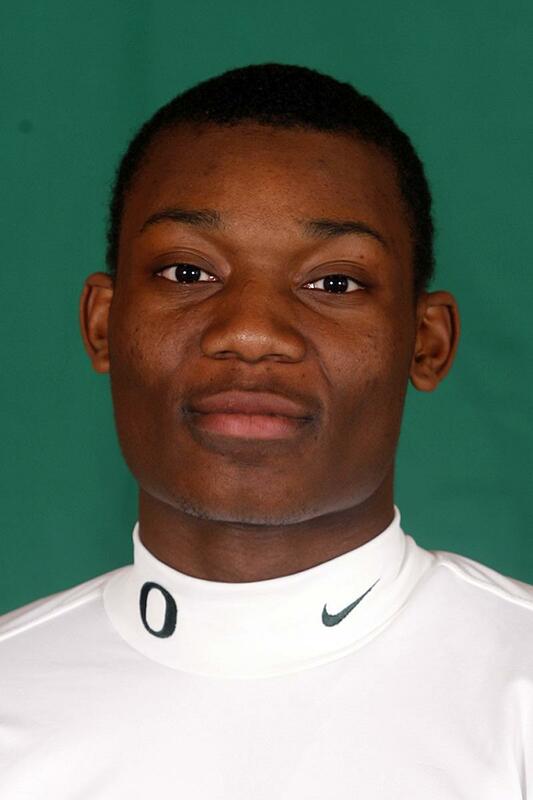 � Redshirted and was recognized as a defensive scout team player of the week prior to the win vs. Arizona State. � Flirted with a story-book ending to a season that began on the other side of the football, and there is certainly no denying he was integral to the team’s offensive success late in the year. But perhaps things came too easy for him in a limited role as a true freshman. Struggled at times last spring when he was introduced to the entire offensive package, yet his 2007 performance convinced coaches that he had found a home catching passes rather than trying to defend them. Characterized as a great athlete who is at his best with the ball in his hands, but now must overcome a few nuances that could become a liability in a full-time role. Consistency is the next step in him becoming more than a specialist at a craft that could offer him unlimited potential once he masters the basics. 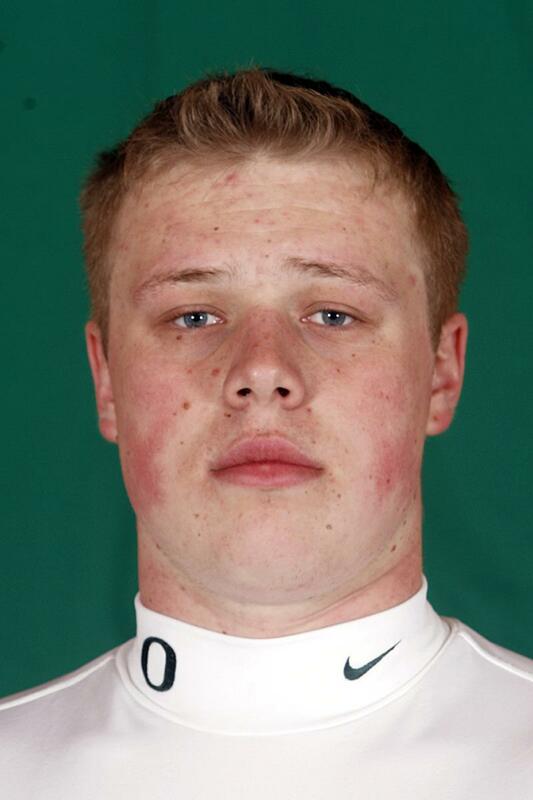 Earned First Team All-NCFA and was named offensive MVP of the conference as a freshman in 2007. Connected on 214 of 349 passes for 3,065 yards and 26 touchdowns with just three interceptions in leading the Rams to a 2007 National Championship, the team’s fifth since 1999 and first since 2003. Named MVP following CCSF’s 31-28 victory against Mt. San Antonio in the California JC State Championship game. 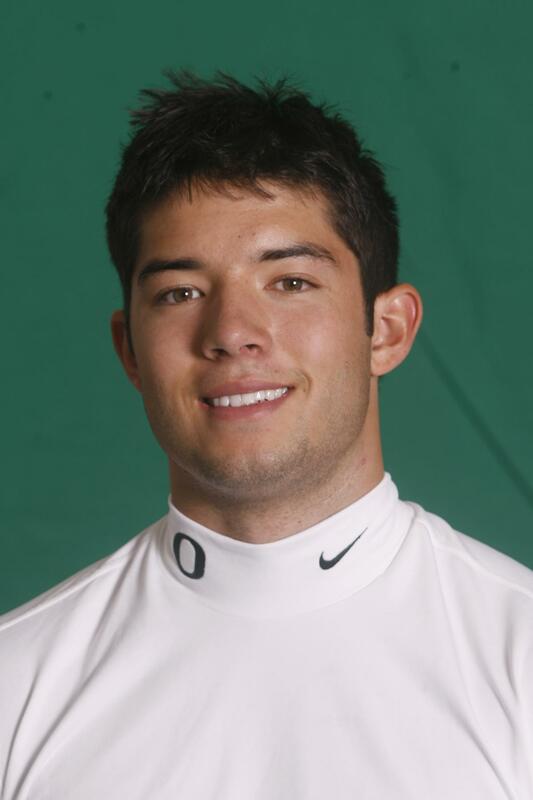 Masoli threw for 252 yards and two touchdowns in the contest. Rated a five-star JC recruit by Scout.com. � Thrust into full-time duty late last year when injuries surfaced before succumbing to his own shoulder ailment. Returned to health last spring and demonstrated signs of challenging for extensive playing time this fall. Relies on great instincts and anticipation to recognize what is unfolding before the play develops. Improved his consistency in the spring and demonstrated improved maturity since the start of spring drills. 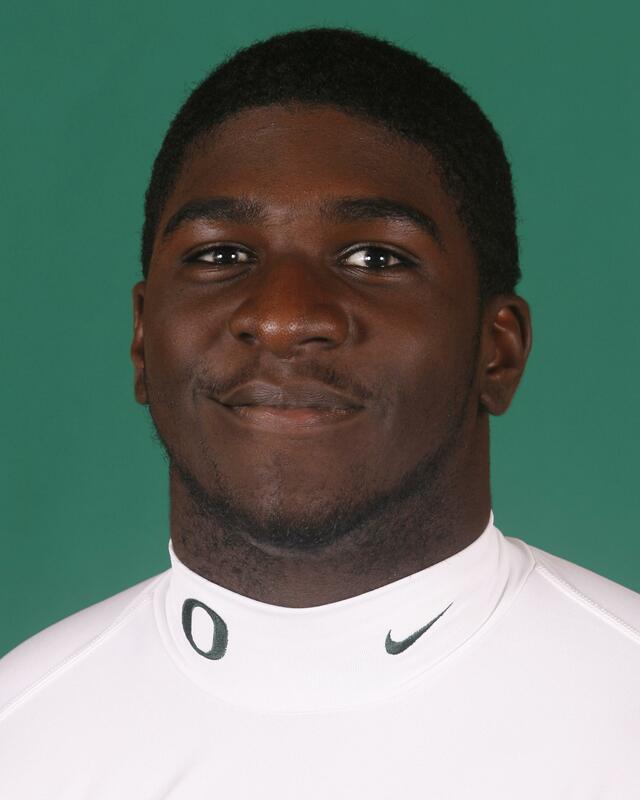 Contributes to a strong inside presence at the heart of the Oregon defense. Led all tacklers in the Spring Game with 10 stops, including three for a loss of 15 yards. � Entered the program with great anticipation, which hasn’t waned in the coaches’ eyes despite being used sparingly as a true freshman. That was more a result of the dramatic improvement from his teammates rather than his ability to meet expectations. Worked a great deal on his technique in the spring and demonstrated improvement during his first off-season workouts at the collegiate level. Expected to concentrate on improving his distance and hang time on his kickoffs which will be required in order to become a complete kicker. Yet currently in the mix as the team’s top placements reserve. Has yet to utilize his redshirt year, which could become an option if he were not to emerge as the Ducks’ top choice for all placements. Connected on a 37-yard field goal in the Spring Game. � The former high school quarterback wasted little time making an impact at a new position, utilizing his intelligence to quickly grasp the nuances of the game. Thought to possess the best hands among the team’s tight ends/H-backs. Impressed coaches during last year’s bowl workouts with his retention of the offense from August after excelling while running the opponents’ offense all fall. � Emerged as the one of the spring’s most improved players as he prepares to compete for a starting berth for the first time. 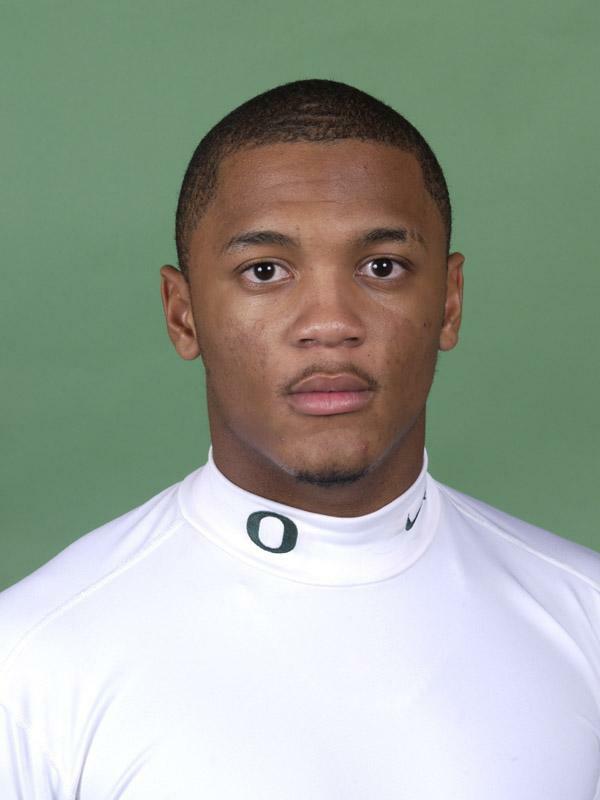 Possesses tremendous ability and draws comparisons to that of Oregon’s 2006 all-conference linebacker Anthony Trucks. Utilizes an explosiveness to get to the football, as well as the versatility to play any of the three linebacker slots, yet most comfortable on the defensive perimeter. 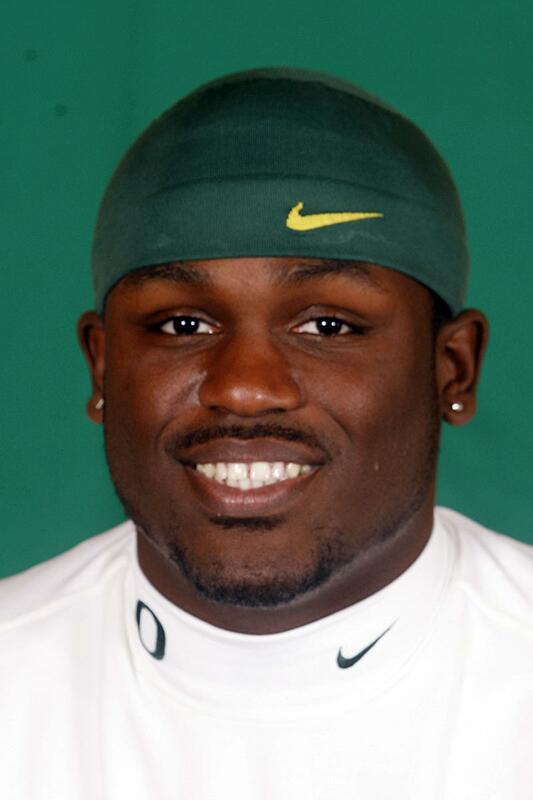 Oregon’s most productive linebacker throughout spring drills, possesses the knack as a playmaker. Benefits from the speed to play any number of positions in various defensive packages and stands out as team’s best cover linebacker. Also is expected to be a special teams mainstay. 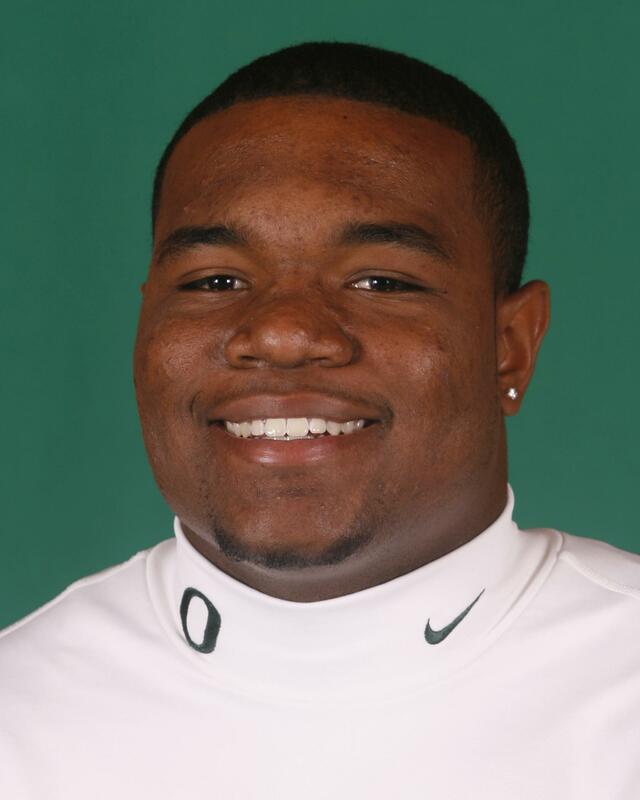 Equaled the top squat best among Ducks’ linebackers (445 lbs.) 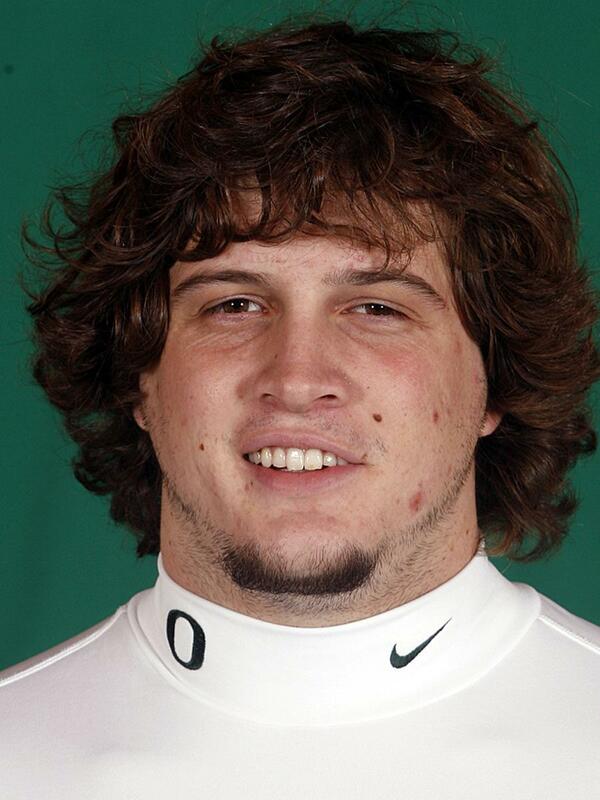 at 2008 winter testing, and credited with position’s best power clean mark (319 lbs.). Finished the spring with five tackles in the Spring Game. 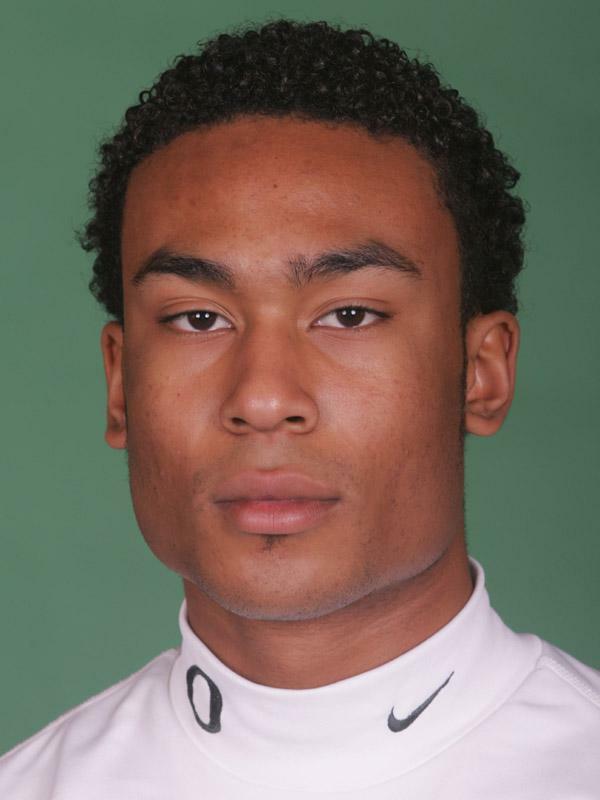 � Made five appearances with first tackle as a collegian coming in the season-opener vs. Houston. Saw the field for 13 plays at Stanford and nine vs. Fresno State. 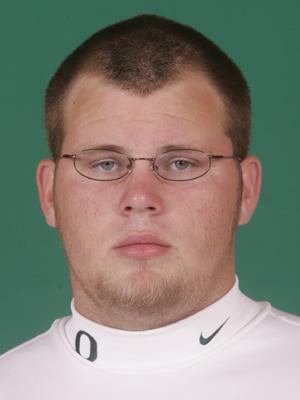 Was declared academically ineligible for Fall '08 and won�t play this season. He�ll remain enrolled at the university and practice with the team following the opener. � Exceeded expectations as a true freshman and took advantage of sound fundamentals to step onto the field sooner than some would have expected before injuries took their toll in the latter going. Displayed an unsurpassed toughness and sure hands to pace a quartet of Division I novices in yards and receptions. Encountered a solid spring showing and proved to be very consistent, while utilizing his intelligence to overcome any physical deficiencies. Benefits from running crisp routes and manages to be in the precise location that quarterbacks expect him to be. Ran with the football with more authority in the spring, now needs to further enhance his position by being more decisive with his first two or three steps immediately following the catch. � A two-time weekly scout team honoree, earning accolades for preparations leading up to Washington State (defense) and UCLA (offense). 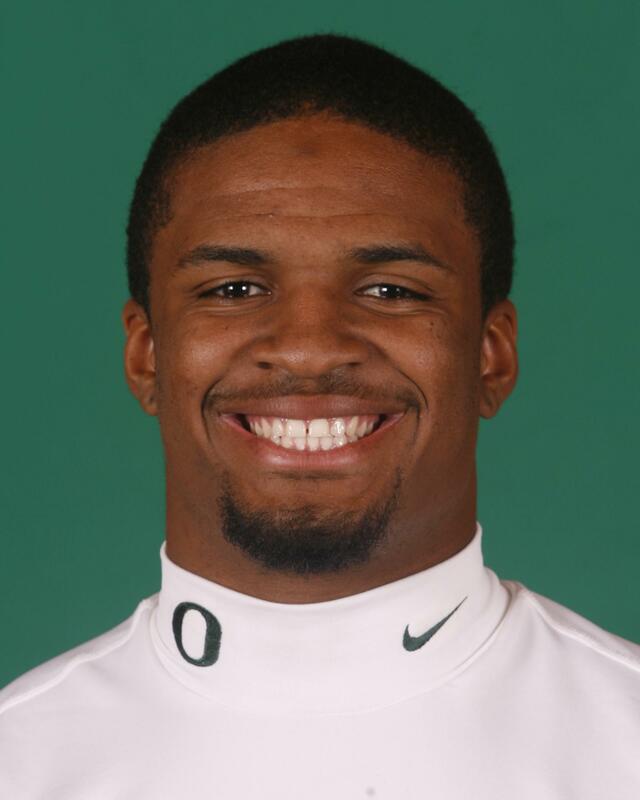 � Characterized as one of the team’s best pure athletes at linebacker who professes a true love for the game, will return as a full time defender after playing both sides of the football as a redshirt freshman. Overall development slowed due to unselfishly splitting time on offense a year ago, yet made up for lost time in the spring. 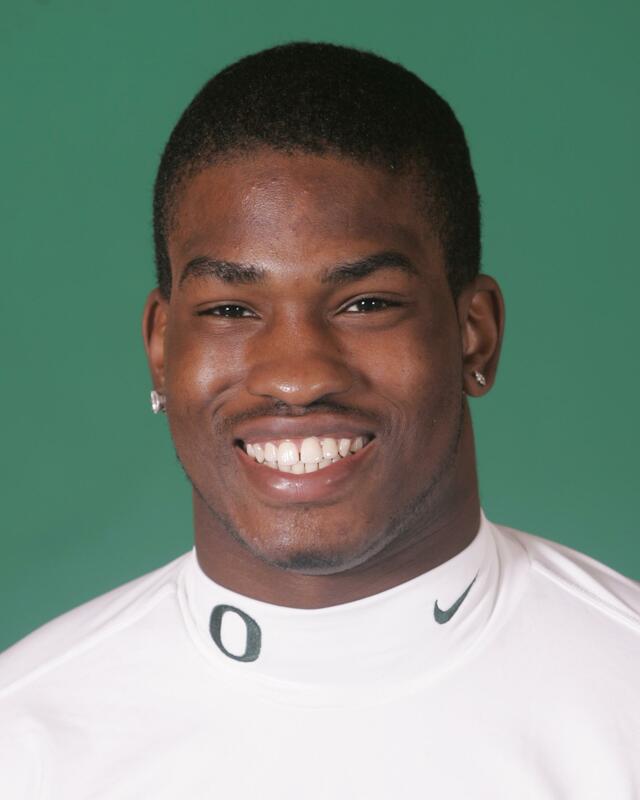 Parlays speed as program’s fastest linebacker (4.72 electronic 40) with power, equaling position’s top squat (445 lbs. 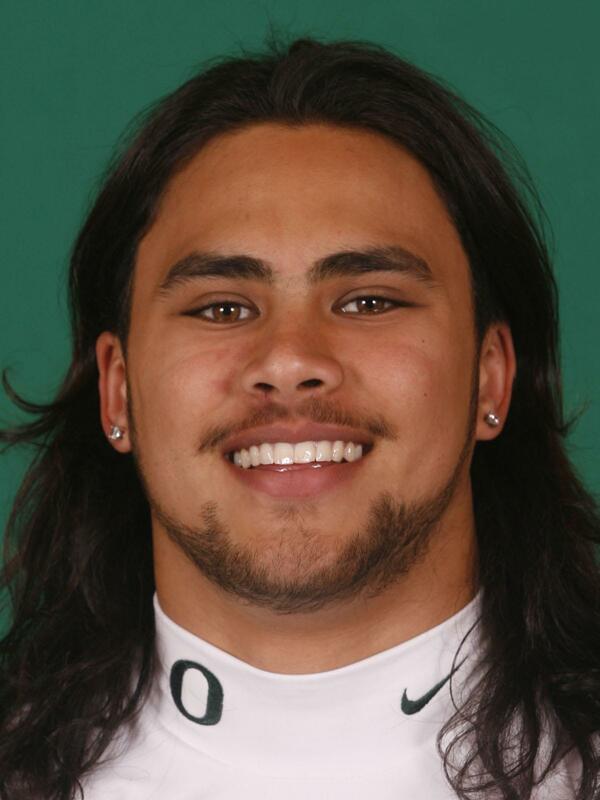 ), its second-best power clean (297 lbs.) and posting the second-best bench press (355 lbs). 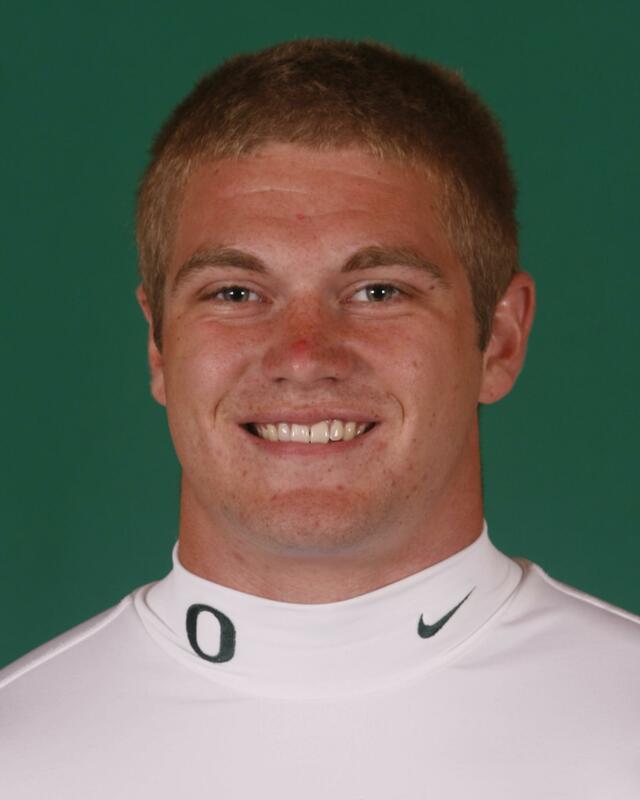 Already described as one of team’s best blitzers despite still looking forward to his first play from scrimmage. Possesses all the physical tools and unlimited potential as a playmaker once he becomes more familiar with the defense and improves his endurance. 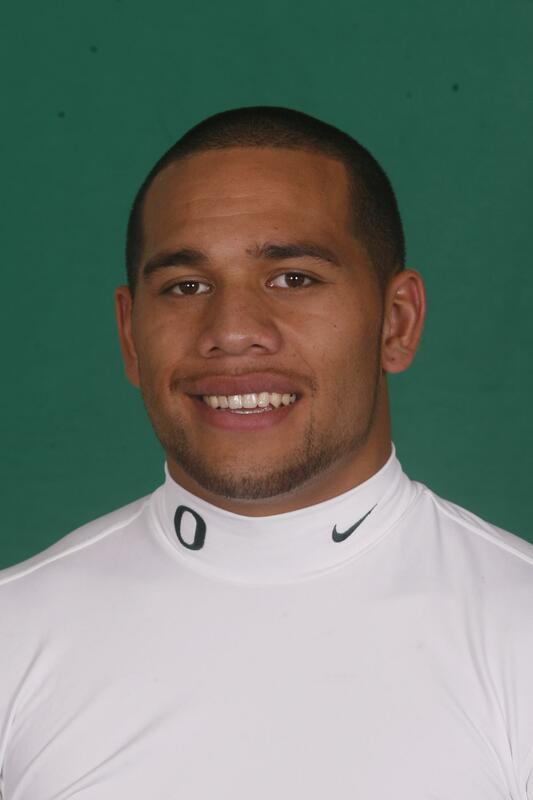 Recorded three tackles in the 2008 Spring Game. � Nagging injuries contributed to a slow start in the spring before he was able to display his true talents towards the end of off-season drills. Tremendous natural instincts should allow him to be a definite factor for playing time at the Will linebacker slot but needs to gain a better grasp of the defense, as well as improve his speed and strength, before reaching his potential. Has developed a knack for getting to the football but it’s crucial he works hard during the off-season and gets off to a good start in the fall in order to enhance his opportunities. 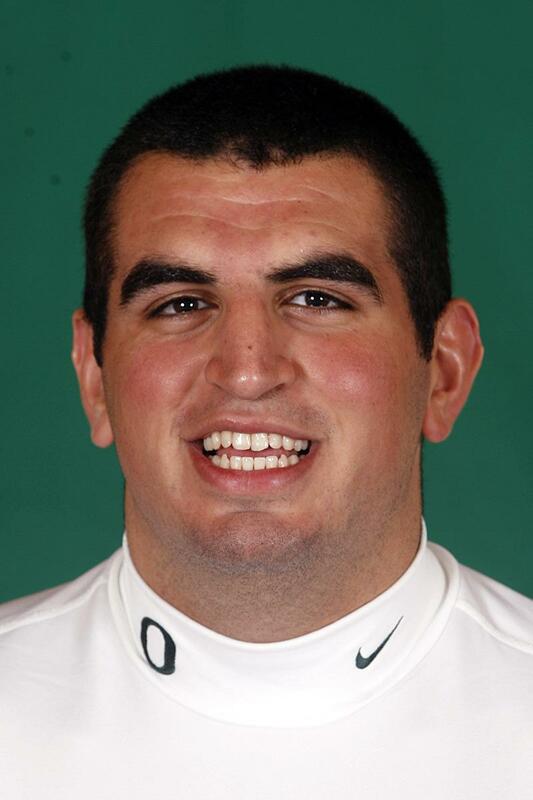 Posted two tackles in the 2008 Spring Game along with breaking up two passes. � The All-American exploded on the scene as one of the nation’s top big-play artists a year ago and there’s no reason to expect he won’t enjoy more of the same success in his final collegiate campaign. Begins his senior year ninth all time on school’s quarterback sacks list and tackles-for-loss ledger. Also attracted deserved national attention as he has been included among the candidates for the Nagurski and Lott trophies, which are awarded to the nation’s top defensive players. Extended his string of consecutive starts to 23 games while he has played in all 38 outings since stepping onto the field as a true freshman. While he first caught the coaches’ eyes as a pass rush specialist his first season, has evolved into a complete player who also is solid defending the run. Epitomized as a player with a constant motor who refuses to be outworked by the opposition and exhibits a great passion for the game. One of the team leaders in the weight room as well as the practice field relishes his role as the underdog despite not being the strongest or biggest player on the field. Understands the game and prides himself in spending time in the film room as well as surveying the opposition play-by-play prior to the ball being snapped. But above all else, few players are able to coax more out of their bodies than the two-time academic all-conference honoree. Team took the L.A. City Championship in both 2007 and 2008. 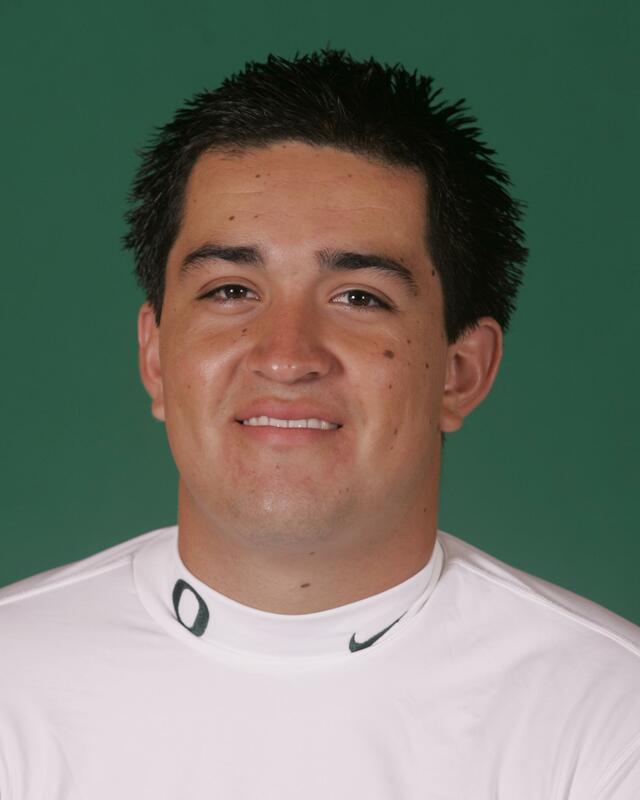 Individually, was named to the All-West Valley League Team as both a junior and senior, also named all-city in 2007 and 2008. An all-area selection following his senior season. Named a three-star recruit by both Scout.com and Rivals.com. � Rose to the challenge late in the year in his final two appearances, putting up numbers in the Brut Sun Bowl win that could have challenged for MVP honors. Is a smart player who takes advantage of his assets and plays within any limitations. 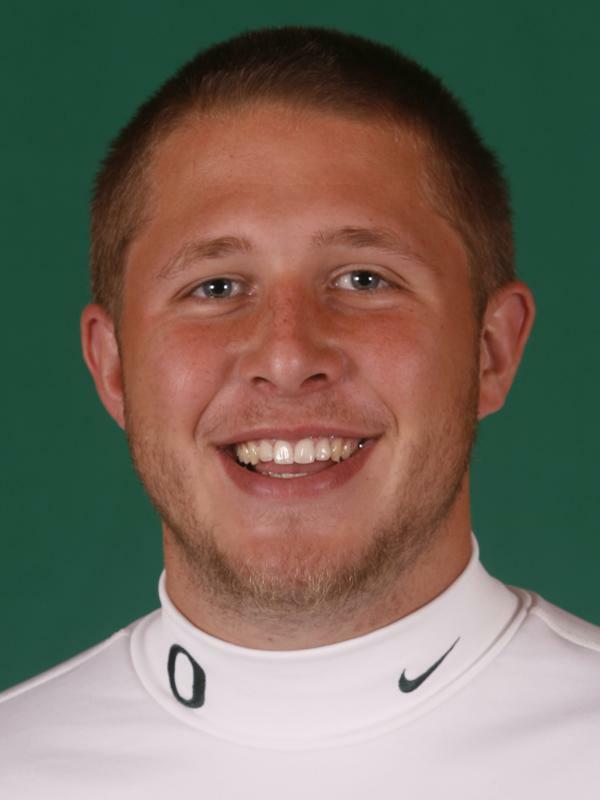 Understands the game while gaining a command of the Oregon offense, and has taken advantage of lessons learned from being the son of a football coach. Should benefit from more repetitions down the road, as well as the size that enables him see over the line of scrimmage and watch things develop downfield. 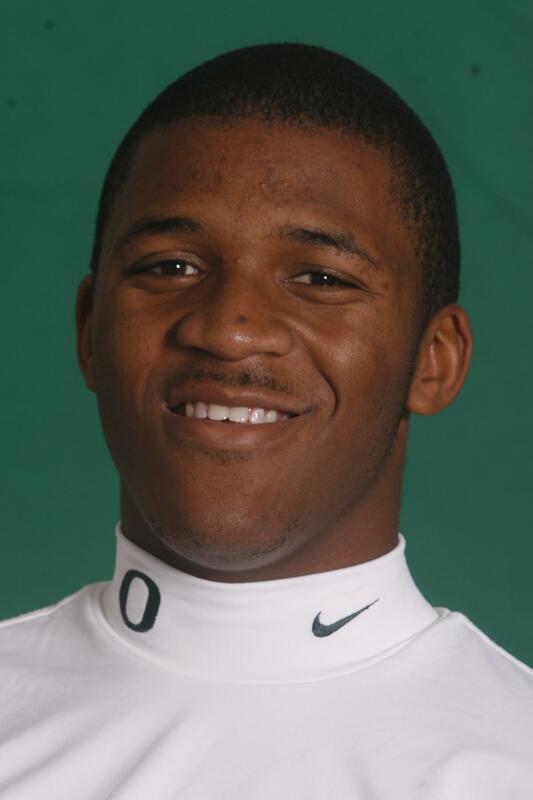 Completed three of seven passes for 82 yards and one touchdown in the 2008 Spring Game, in addition to an 8-yard scoring run among his three carries for 13 yards. 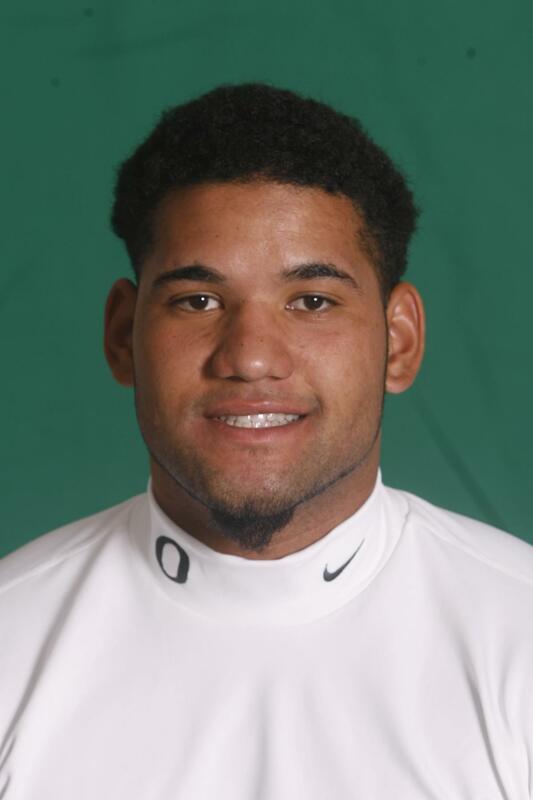 � Converted to middle linebacker in the spring, which is where coaches had projected him when they recruited him before injuries necessitated a temporary change in plans as a true freshman. Adapted to the switch well despite not playing the post since he was a prep freshman. Coaches excited about his athleticism and intelligence, which resulted in him gaining a firm grasp of the defense over the course of his 15 spring practices. Pass coverage skills will be his next area of improvement needed before completing his transformation, yet possesses all the physical skills needed to become successful behind the first line of defense. Already demonstrated the skills as a strong pass rusher as a down lineman and believed to be more potent in blitzing situations from his new position due to his body control and ability to change directions. Tied as the second-leading tackler in the Spring Game with seven stops. 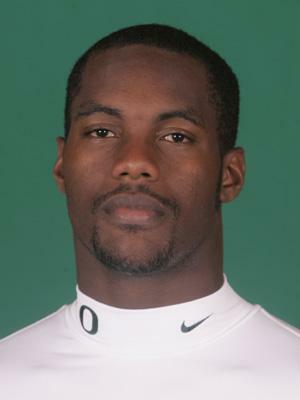 � Coaches would really like to have him back for two more years yet had few options other than pull him out of his redshirt year when the need presented itself in 2007. This year will be no different when the opportunity exists for a second mature receiver to step forward. Wasn’t able to arrive on campus until just before the start of camp last fall and found himself hustling to learn the offense. Spent the majority of last season running the oppositions’ offense on the scout team until he was pressed into service in the seventh game of the year. Needs to take advantage of his opportunities during the off-season by tackling the intricacies of the game in order to insure his improvement in the fall. Demonstrated signs of accepting those challenges during the spring and certainly possesses the physical tools that are critical for his success. Improved his technique since last fall, which allowed him to shed defenders at the line of scrimmage faster the latter half of off-season workouts. Also did a much better job adjusting his routes to catch the deep pass in the spring, and will gain momentum as he’s able to take more reps.
� Persistence has paid dividends for the blue-collar walk-on who has positioned himself to get onto the field through a strong work ethic. Has helped himself by understanding all three linebacker positions as well as becoming an asset on special teams. Prides himself as a tough competitor who runs well, enhancing his abilities to guard the perimeter and force traffic inside. Described as a solid player who is seldom out of position, now needs to complete the equation by finishing the play. 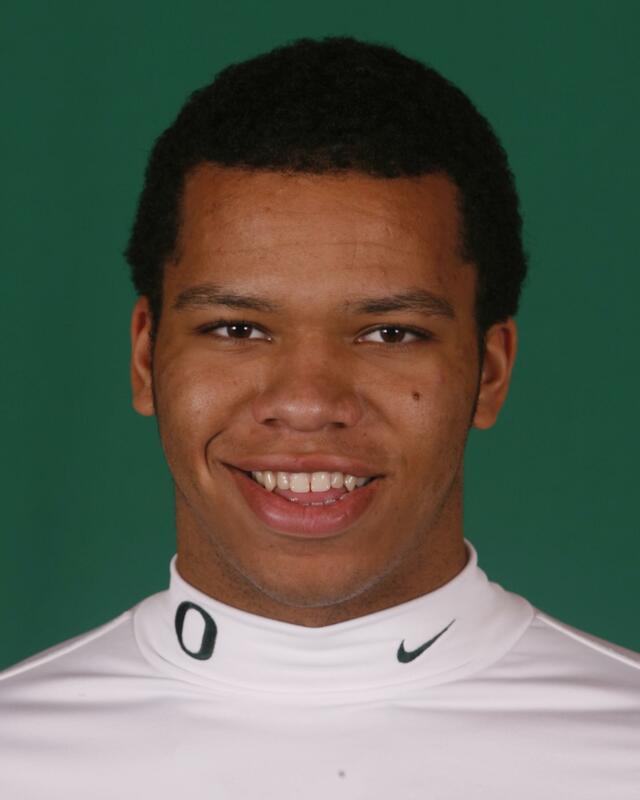 Credited with 0.5 quarterback sacks in the Spring Game among his five tackles. 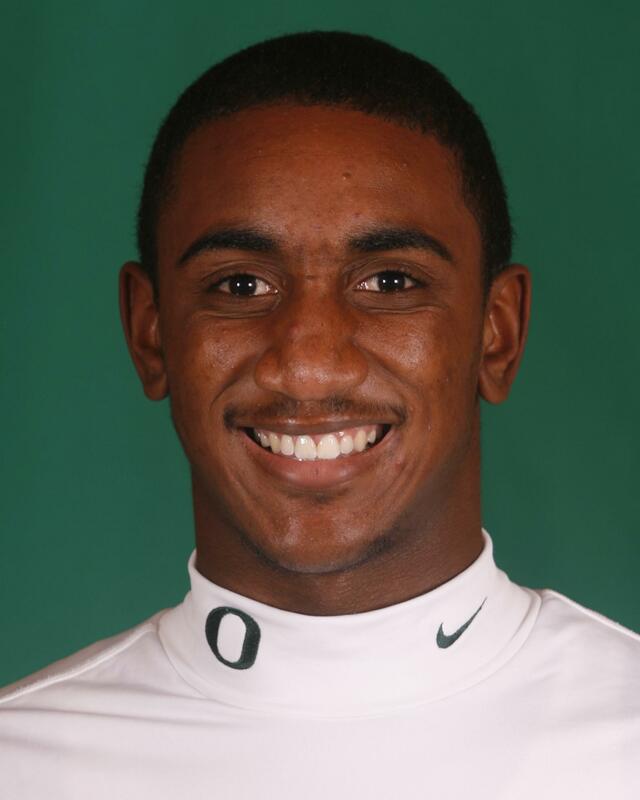 � Walked on at the end of fall camp and redshirted. � Few players may be as underappreciated as the veteran stalwart who is coming off a great season. Although his size may be more conducive to him playing on the perimeter, he offers the flexibility of being able to play any of the four positions along the front line. Provides coaches with a consistent blue-collar attitude and the knowledge that he will give supreme effort on every snap. Characterized as an outstanding leader who works equally as hard on the field, in the weight room or in the classroom, and serves as a tremendous role model for the underclassmen. Overcomes any size deficiencies as a defensive tackle by utilizing sound technique and experience, as well as a great understanding of how to attack the offense. Yet coaches hope he can spend the majority of his time his senior year at defensive end. Completed spring drills with 1.5 tackles for loss among his four stops in the Spring Game. 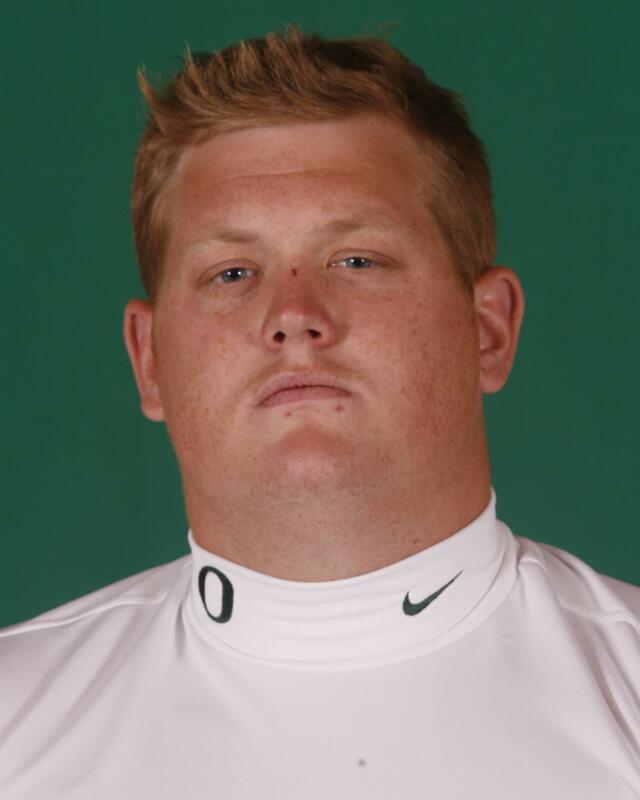 Recruited as a center but has switched to defensive tackle in fall camp. Was named a four-star recruit by Scout.com and a three-star recruit by Rvials.com. � Made tremendous strides a year ago since working to get back into the groove following a two-year hiatus from game competition. 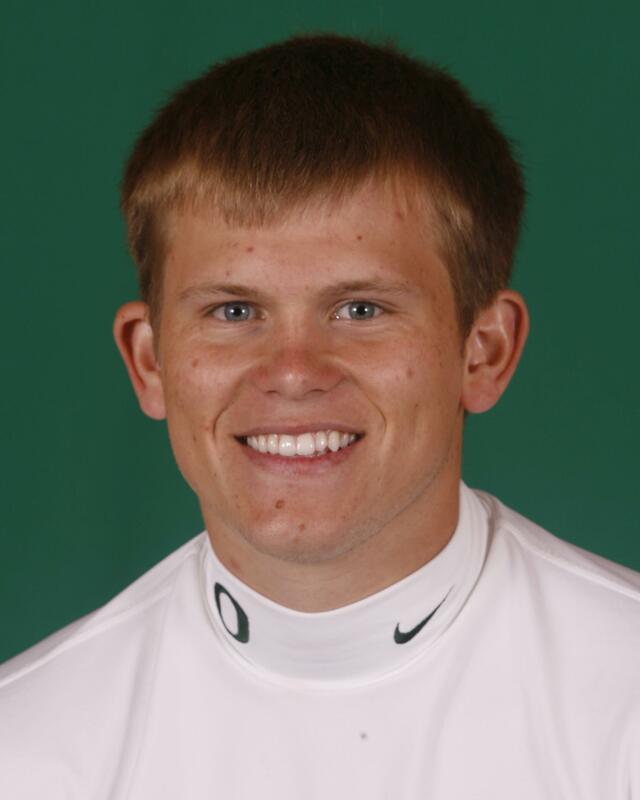 Moved into a tie for eighth on school’s single-season punting average ledger (41.7 avg.) despite the fact only four other kickers in school history have ever attempted more than Syria’s 71 punts in one year. 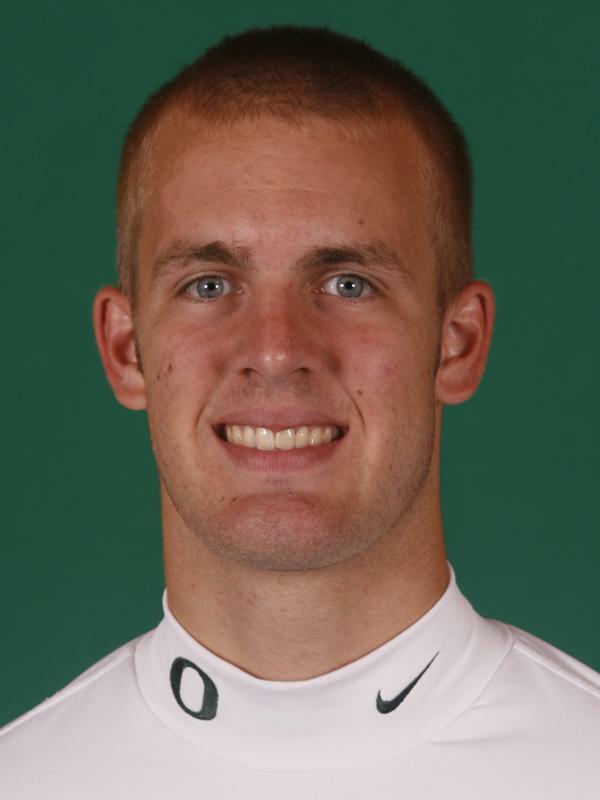 Possesses a very strong leg and benefits from a two-step technique that allows him to get kicks off faster than any other punter that Coach Bellotti has worked with in 37 years of coaching. With continued improvement and consistency, boasts all of the physical tools that teams look for at the next level. Earned first-team all-conference and all-academic honors while playing at Blinn Junior College. Rated the No. 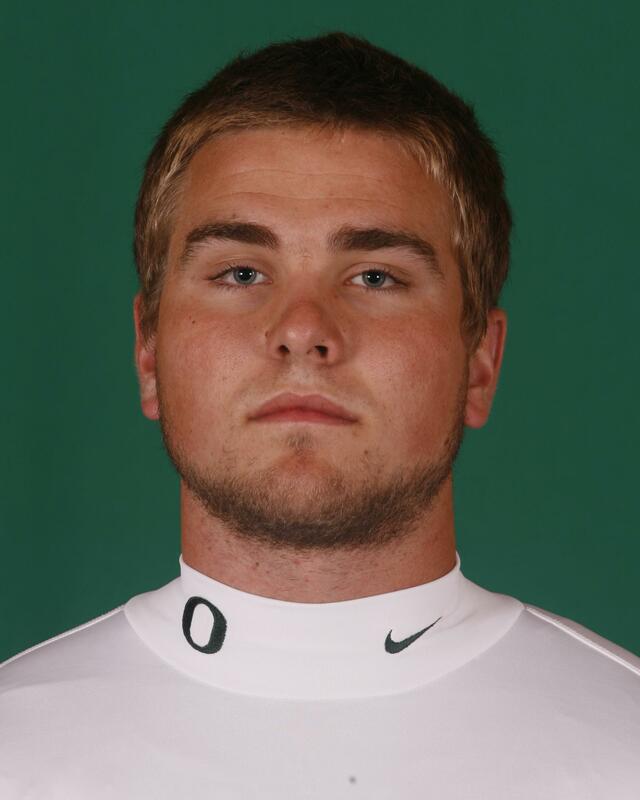 1 junior college long snapper recruit in the nation. � Benefits from being able to play either guard position well but added to his versatility by taking snaps at center the last couple of weeks of spring drills. Characterized as program’s most intelligent offensive lineman who possesses a solid grasp of all offensive line assignments on every play. Is a solid technician who rarely makes mistakes on assignments. Provides all the intangibles that coaches look for, with his experience in the system serving as a definite asset. Will push for more extensive time on the field if he is able to increase his strength levels and become more physical during the off-season. Continually improved as the spring progressed, with his development expected to accelerate once he gains a better grasp of the offense. Runs very well for a player his size and displayed sound mechanics throwing the football. Benefited from the experience of playing in a spread offense at the high school level. His youth provides him plenty of time to further develop for the future. 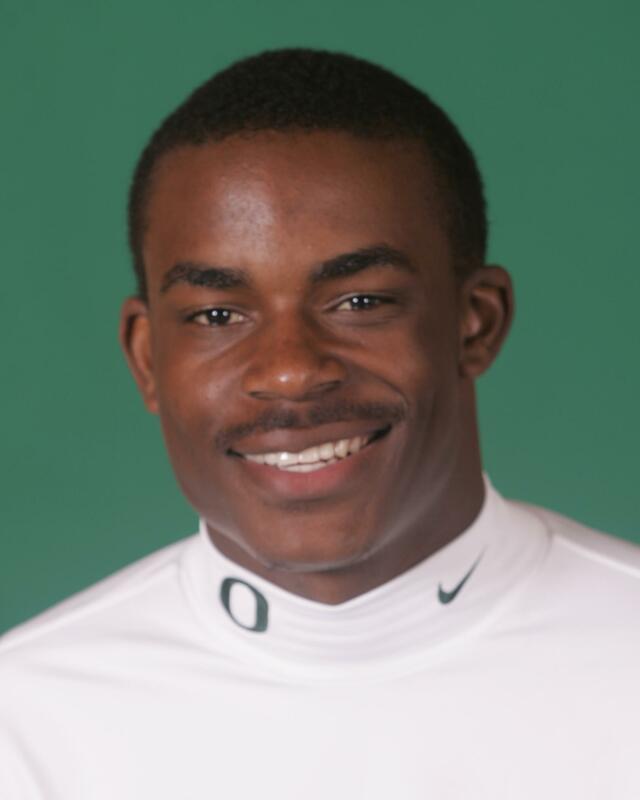 Graduated early from high school and enrolled at Oregon as a 17-year-old student during the winter quarter to get a head start on his first year in the program. Started throwing to teammates nearly three months before the first official spring practice. Completed three of 13 passes for 17 yards in the Spring Game. Redshirt season. Was recognized as a scout team player of the week on special teams leading into the Arizona State game. � No one has encountered more frustration from not being able to demonstrate his abilities than Bo, who continued to be hampered by injuries in the spring. Possesses all the physical qualities to be a successful offensive tackle at the collegiate level � size, intelligence and athleticism. Only needs to remain healthy in order to put those attributes to the test. Once he regains his health, he should be able to increase his strength and production. 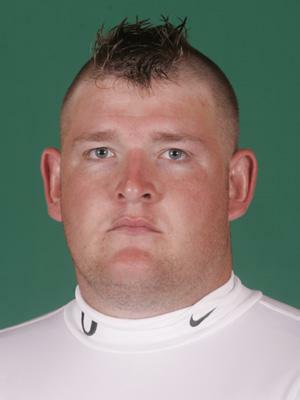 Looms as team’s fastest offensive lineman, sporting 40-yard best of 5.34. � One of the team’s best overall athletes possesses the physical skills to play anywhere on the field on either side of the football. Experience gained the last two seasons has provided him with the edge in confidence needed that there is no one better at his craft. 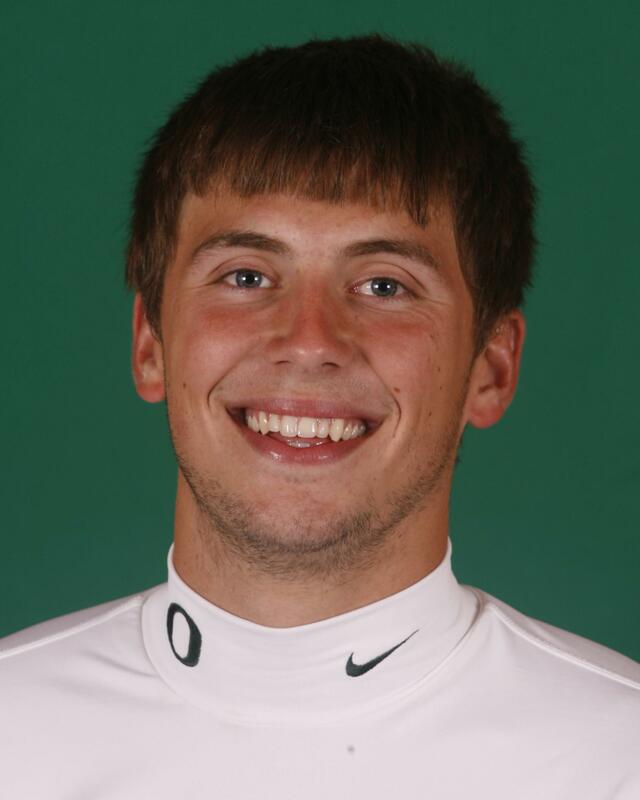 The playmaker and pre-season All-American looms as the Ducks’ only defender to score two touchdowns a year ago while breaking up more passes in his first two years (27) than any Oregon player since 1992-93 (Alex Molden, 30). The third-year starter extended his string of consecutive opening appearances to 18 games while boasting of 25 career starts. Utilizes an extremely high football intelligence and tremendous instincts to anticipate what the opposition wants to do. Benefits from great speed as the team’s second fastest player (4.61 electric 40-yd. time) to close fast on receivers, and is arguably the team’s best tackler. � Entering his fourth year in the program, possesses a great opportunity to step up his play and become a part of the rotation on a regular basis. Solid spring showing was a result of him remaining healthy, which is dependent on him paying close attention to his conditioning. Displayed a renewed commitment to working hard in the spring and demonstrated flashes that he could provide much-needed depth along the front line. Must continue his hard work throughout the off-season in order to be effective for the start of fall camp. Possesses the size to become a factor at this level and benefits from great quickness and explosive lower body strength. Once he learns to use his hands to ward off potential blockers, he maintains the attributes that could make it difficult on the opposition. � Paid immediate dividends last fall which isn’t automatic for junior college transfers in their first year at the Division I level. Has set the bar higher for greater results now that he has been in the system for one season. The projected starter at right end benefits from a great work ethic and runs well for the program’s biggest defensive end. Also possesses tremendous athleticism and strength, and is equally adept at defending the run and the pass. Gained consistency as last season wore on as a result of becoming more familiar with the system. The all-conference caliber standout can be expected to let his athleticism rise to the forefront and continue to be a force on the perimeter. Spring injuries hampered further development yet expected to take up where he left off last season. � Continually improved the last half of the 2007 season, coaches now hopeful he will aspire to progress into a more physically dominating force, specifically while propelling team’s running game. Must also continue to improve his pass blocking technique. Opened a lot of eyes at Michigan, which proved to be a major step towards boosting his confidence and allowing him to enjoy an all-conference caliber Division I debut. Development allowed team’s fixture at left tackle to shift to center, but would now appear to be ready to step out of the shadows on his own behalf. Also has stepped up his mental understanding of offense’s objectives. Ranks as one of team’s strongest offensive linemen, topping position mates with 415-lb. bench press. One of his few downsides was his absence from substantial amounts of spring drills due to lingering hamstring ailments, which slowed his improvement. Must continue to work hard during the off-season and challenge himself to condition his body to prevent injuries to become a factor in the fall. His post-season performance earned him a spot among the 75 players selected on the Sun Bowl’s all-time 75th-aniversary team. � Afforded three stars by Rivals.com as he has been tabbed as one of the top 70 linebackers in the country. 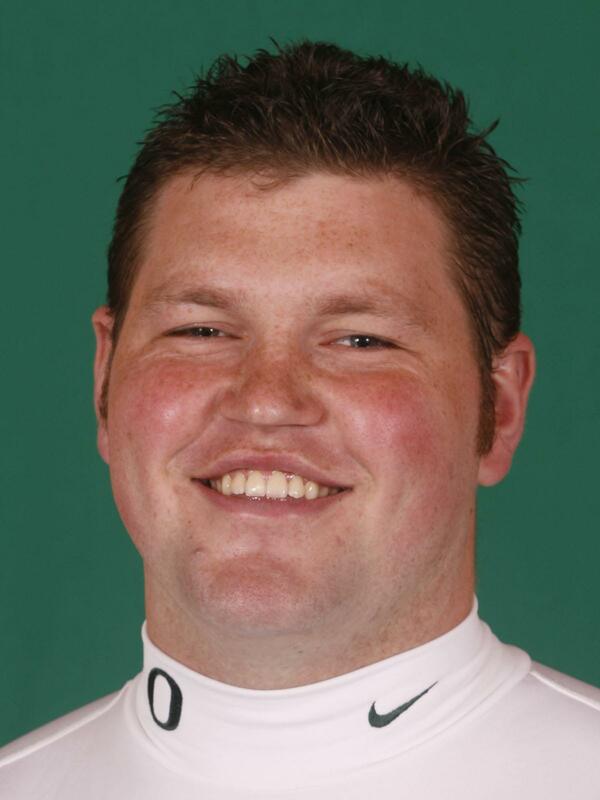 The all-Coliseum League and all-city choice was credited with six quarterback sacks among his 153 tackles in 2006, in addition to providing four forced fumbles, one fumble recovery and returning one interception for a touchdown. Classified as an aggressive player who craved contact and was able to drop into pass coverages as well as roam from sideline to sideline for last year�s 9-4 Cougars. 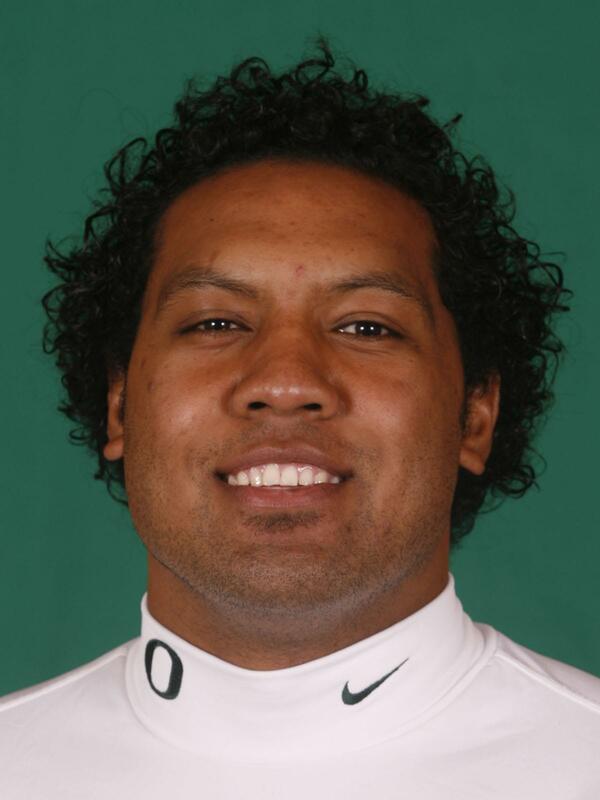 Completed 2005 with 87 tackles, four quarterback sacks and one interception. 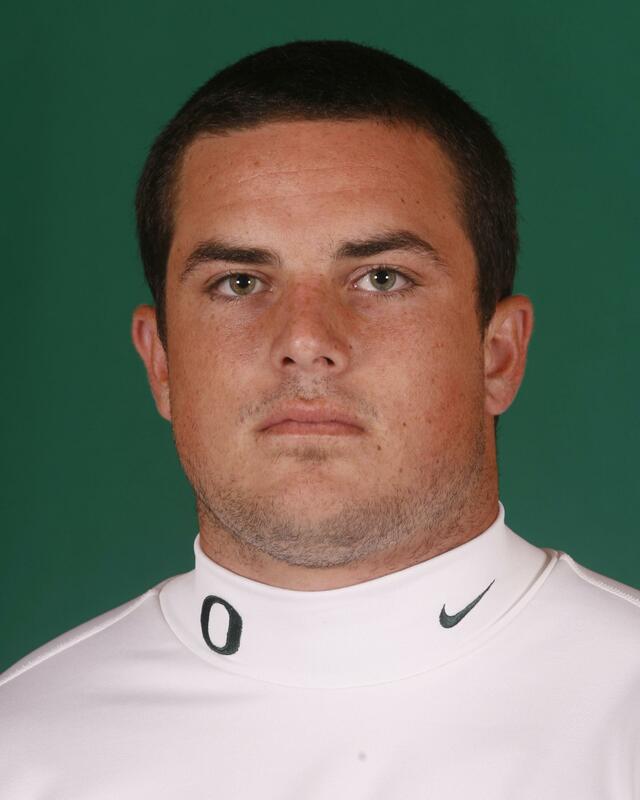 � The offensive line leader and 25-game starter also reigns as the Ducks� most versatile interior standout. The two-time all-conference honoree provides the flexibility to play any one of five positions along the line after excelling at left tackle each of the past two seasons, yet where he is positioned in 2007 is likely to depend more on the proficiency of those around him. Combines an element of athleticism, toughness and competitiveness that allows him to stand apart from most of his peers at the conference level and rank among some of the best in the country. Maintains an unmatched work ethic and an attitude that doesn�t allow him to quit, as well as displays no fear. Missed all of spring drills while recovering from hernia surgery, which also affected his winter workouts. 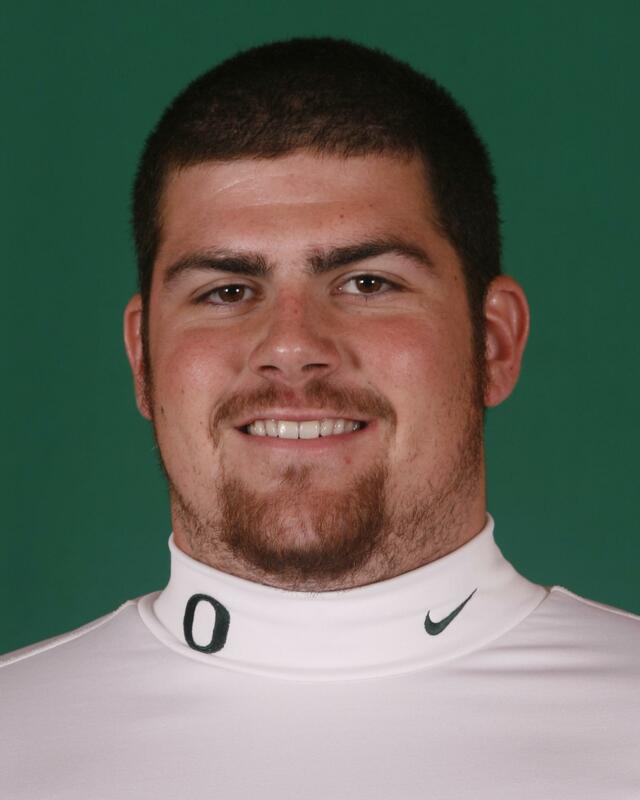 Completed 2006 testing equaling the offensive line�s best power clean (341 lbs.) and maxed out with a 495-lb. squat. Also finished with the unit�s second-fastest 20-yard shuttle clocking (4.41). 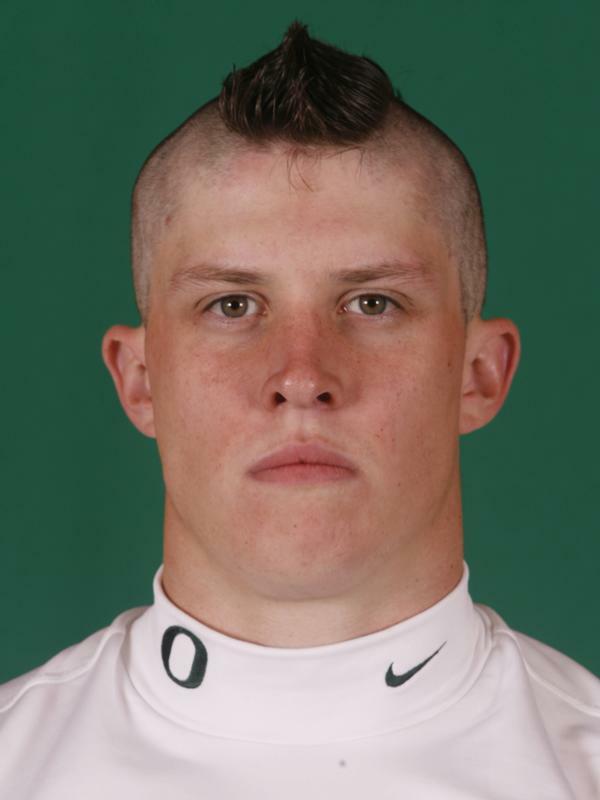 Participated as a member of the scout team during his redshirt season. � The unheralded walk-on made an impact in the spring of 2006 and he must regain that form to be effective. Injuries have continued to plague his development and opportunities since his prep tenure. Missed most of last spring while recovering from his knee ailment that limited his effectiveness in the fall, and hopes to put the obstructions behind him. Was moved to free safety when the need arose due to injuries to others, and possesses the skills to excel there. Maintains a tough demeanor, he doesn�t shy away from contact, he runs well and provides exceptional skills in downfield coverages. Has improved as a tackler and boasts the talent that earned him athletic financial aid at the start of last season. 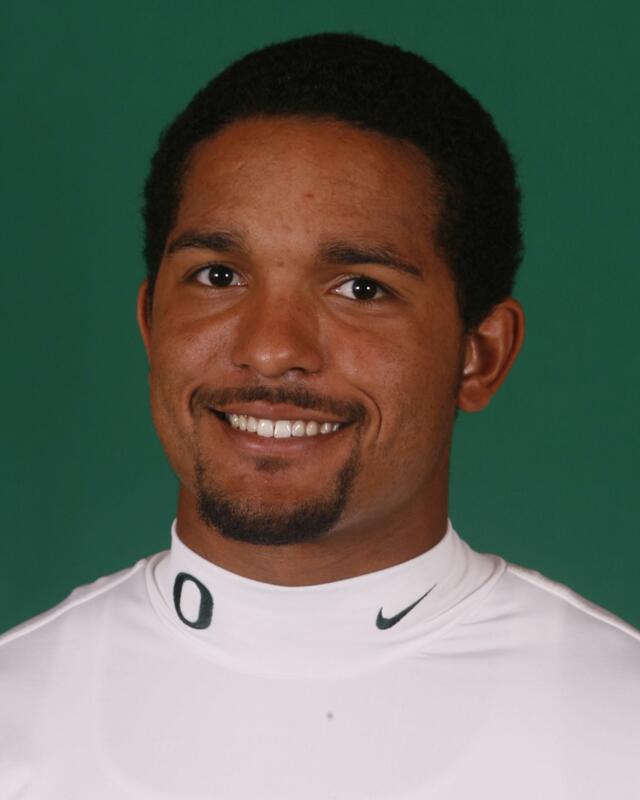 Although last winter�s conditioning was affected, he led all defensive backs with a 450-lb. squat during 2006 testing. � Ranked among the top 20 players in the state by Rivals.com as well as one of the nation�s best offensive line prospects, the SuperPrep All-American and four-star honoree (Scout. 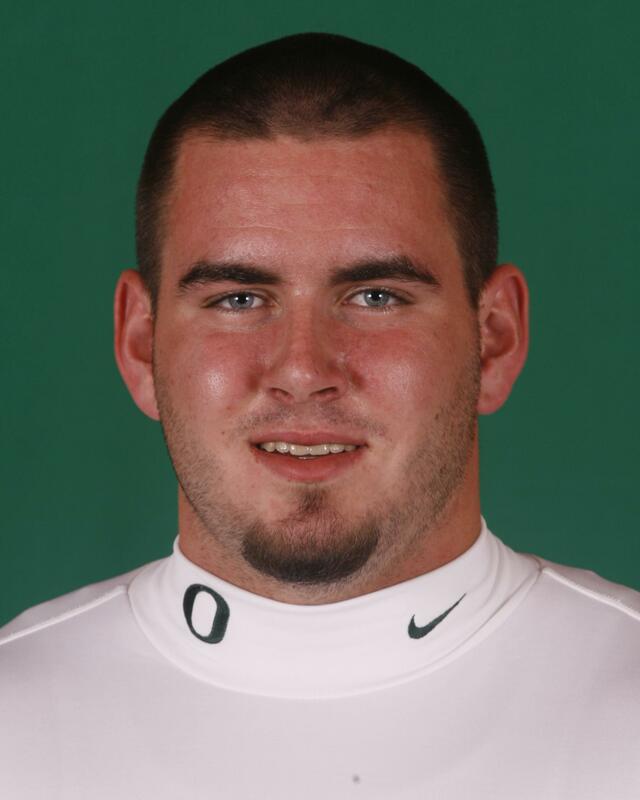 com) was considered among the elite five offensive linemen in California. Paved the way for school that finished sixth in the Los Angeles City Section in scoring (369 points) and eighth in total offense (366.9 avg.). Was physically overpowering at times due, in part, to a his strength, as epitomized by his 315-lb. bench press and 400-lb. squat. Played his final two seasons for the Toreadors, who posted a 6-5 record in 2006 en route to second place in the West Valley League, after being displaced by Hurricane Katrina. 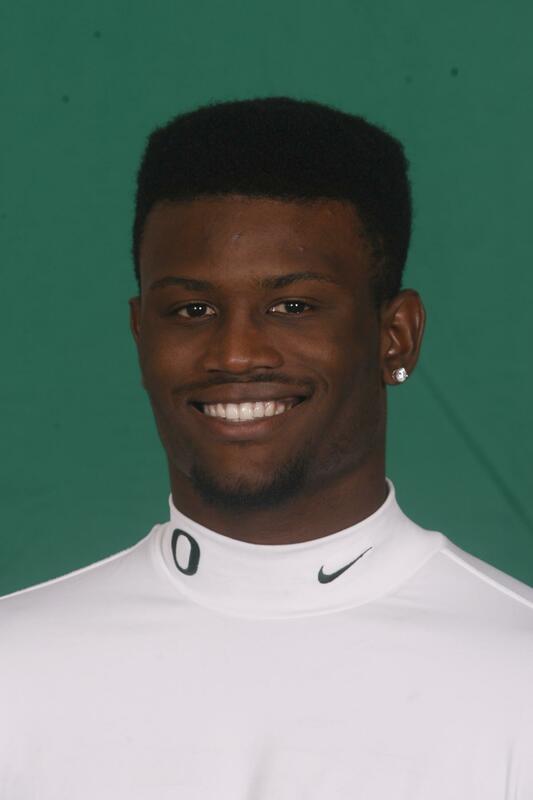 � No Oregon receiver offers greater potential to elevate himself to another level than last year�s leader. Perhaps the only deterrent standing in his way is his self-confidence and his realization that he could be on the verge of something special with continued hard work and refining his mental focus. 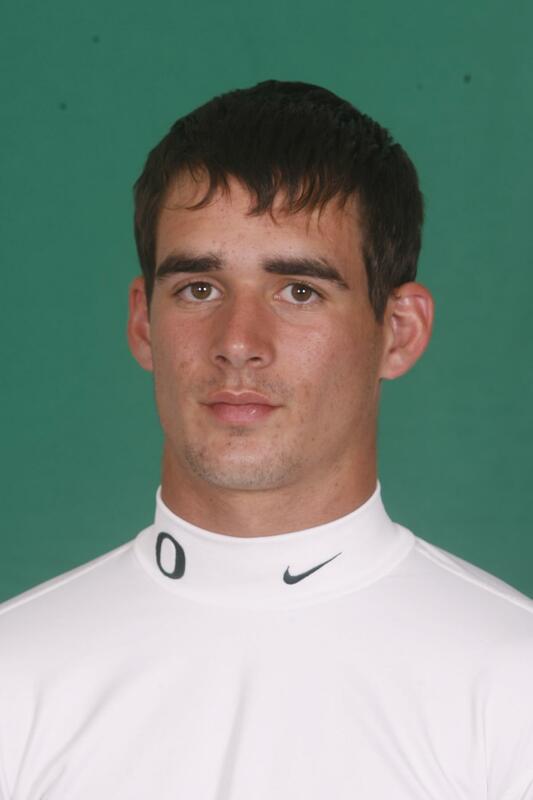 Encountered a phenomenal 2006 campaign, emerging from under the radar and developing a knack for taking over a game, as witnessed by him catching seven of Oregon�s eight first-quarter completions at Arizona State. Now he needs to work on improving his concentration catching the long pass as well as utilizing his size to his advantage. Once he masters a grasp of offense�s new intricacies, he is expected to take up where he left off in the midst of last year. Also needs to enhance his self-motivation skills and push himself when there is no one else behind him providing competition. Was clocked with position�s fastest electronic 40 time (4.61) in addition to ranking as one of program�s strongest receivers (1st - 352 lb. power clean; 2nd - 435 lb squat; 2nd - 340 lb. bench press). 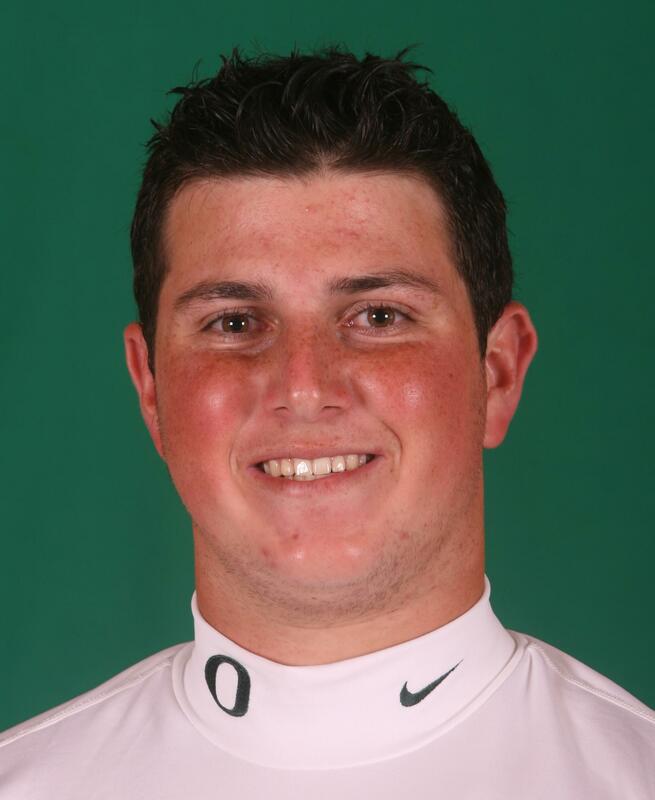 Delayed enrollment until the 2008 winter term while recovering from shoulder surgery after originally signing with the Ducks in 2007. Took a little time adjusting to the Division I level in the spring before finishing the second half of off-season drills strong. Displayed outstanding intelligence and intensity, as well as the demeanor as a competitor and the drive to succeed. 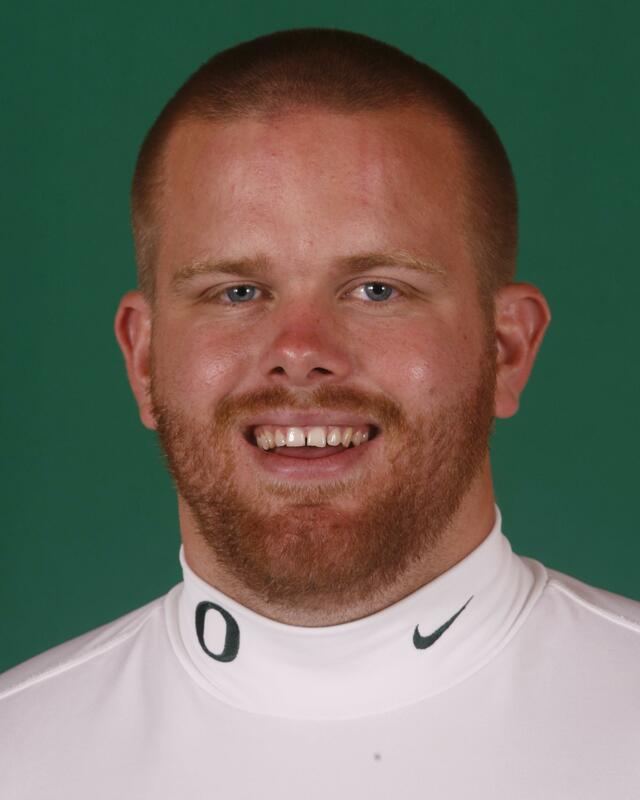 Demonstrated excellent movement and the balance required from interior linemen in the Oregon offense, and was anxious to absorb all the feedback he could from coaches in order to ease his transition. Additional time in the program will allow him to improve his strength levels needed to compete at this level.